Papers stemming from the INTENT conference on ‘Telecollaboration in University Foreign Language Education’ held at the Faculty of Philosophy and Letters, University of León, Spain, on 14 February 2014. Promoting critical thinking in online intercultural communication. Marie-Thérèse Batardière. Why in the world would I want to talk to someone else about my culture? Chesla Ann Bohinski and Yumei Leventhal. A blended learning scenario to enhance learners’ oral production skills. Hee-Kyung Kim. Combining Skype with Blogging: A chance to stop reinforcement of stereotypes in intercultural exchanges? L. Lynette Kirschner. English learning in an intercultural perspective: Russia and Norway. Anne-Mette Bjøru. Pan-American teletandem language exchange project. Aurora Castillo-Scott. An e-portfolio to enhance sustainable vocabulary learning in English. Hiroya Tanaka, Akio Ohnishi, Suzanne M. Yonesaka and Yukie Ueno. ABA English. Reviewed by Rafael Seiz Ortiz. This paper investigates the educational experience arising from the use of an online discussion forum in an undergraduate blended learning language programme; to do this, it focuses on the type of cognitive processes that learners experience during a computer-mediated collaborative task and explores the potential causal relationship between the instructional strategies and the students’ cognitive activity. Findings indicate that the ‘teaching presence’ had a significant indirect influence on the outcome of the online intercultural interactions. Keywords: Computer-Mediated Communication, intercultural interactions, cognitive presence, instructional strategies. In Computer-Mediated Communication (CMC), learners have the opportunity to engage in interactive and collaborative activities with their peers in a blended or entirely online setting. Research has shown that some blended-learning models can transform learning in the sense that learners are no longer receivers of information but active constructors of their own learning through interaction in the new media (Bonk & Graham, 2006). The paradigm shift for teachers using Web 2.0 tools involves “rethinking and redesigning the teaching and learning relationship” (Garrison and Kanuka, 2004, p.99) and calls for new teaching-learning practices that extend beyond the familiar classroom boundaries (O’Dowd & Waire, 2009; Dooly, 2010 ). Comas-Quinn (2011) argues that the success of the introduction of online technologies is “in great part due to how well teachers deal with the new ideas and implement them with their learners” (p.221). The influence of the instructional approach on the learning outcomes was demonstrated by Garrison and Cleveland-Innes (2005) when they found that teaching presence in the form of structure (i.e., design) and leadership (i.e., facilitation and direction) was a key factor for students’ deep and meaningful (online) learning. In light of the recent empirical evidence, this paper seeks to investigate the ‘educational experience’ arising from the use of an online discussion forum in an undergraduate blended learning language programme; to do this, it focuses on the type of cognitive processes that learners experience during a computer mediated collaborative task and explores the potential causal relationship between the instructional approach and students’ (collaborative) learning. The Community of inquiry (CoI) framework developed by Garrison et al. (2001) was used to examine students’ cognitive activity as it is specifically designed to analyse online interactions and also, as it is the most widely used framework for A(synchronous) CMC analyses (Arnold, & Ducate, 2006). There are three interdependent structural elements in the framework –social, cognitive and teaching presence; however, only the last two dimensions of the model were considered for this study: the Cognitive presence, which is defined as “the extent to which the participants are able to construct and confirm meaning through sustained reflection and discourse” (Garrison et al., 2001, p.11) and the Teaching presence, which is described as the “the design, facilitation and direction of cognitive and social processes for the purpose of realizing personally meaningful and educationally worthwhile learning outcomes” (Anderson et al., 2001, p. 5). The online discussion forum is integrated in a larger project which promotes a three-phased approach. Language learners have first to select a current French socio-political issue of their choice, retrieve information on the topic from online newspapers and analyse it with a view to producing a piece of work demonstrating thorough understanding of the topic. The Computer Mediated Communication (CMC) task is an out-of-class activity which starts in week 4 of their 12-week course and runs for 6 to 8 weeks depending on the group dynamic; each L2 learner submits his/her assignment on line and is paired with a native speaker who has expressed an interest in his/her topic. Students then engage in a discussion with their respective partners. At the end of the project, all participants have to reflect and report on their online learning experience. Vous rechercherez plusieurs articles traitant d’un même sujet d’actualité et tirés de journaux/ magazines de différentes tendances -Le Monde, Le Figaro, Libération, l’Express, la Croix, le Nouvel Observateur, etc., les lirez, et les référencerez. Vous choisirez l’un des points controversés que vous aurez abordés pour en discuter avec votre correspondant(e) et, pour lancer la discussion, vous soumettrez une question qui sera postée sur le forum, à la suite de votre commentaire. Vous lirez les réactions –à vos affirmations– de votre partenaire. Vous défendrez vos arguments et en avancerez de nouveaux. Suite à vos interactions –en ligne– avec un(e) francophone, (1) vous expliquerez si et de quelle façon, votre regard/ perspective sur la question d'actualité étudiée, a changé (150 mots environ) et (2) vous évaluerez la valeur (ajoutée) de l’échange en ligne (150 mots environ). A total of 16 Irish undergraduate students and 16 native speakers of French participated in the project. The Irish students -11 female and 5 male students- were between 21 and 22 years of age and were enrolled on a Fourth Year undergraduate Business and French course; the French module represents 1/5 of their programme and four contact hours per week. All Irish students had taken part in a collaborative Blog the previous year. The native speakers (NS) -12 female and 4 male students- were on-campus Erasmus students; they came from French or Belgian universities and were enrolled in a translation class taught by the present researcher. They were unknown to their Irish partners. The discussion forum was set-up on the Learning Management System (LMS) of the institution for their specific module. In this case, the LMS is called Sulis and is powered by Sakai. Prior to the start of the exchanges, a discussion thread was created for each topic/each dyad to facilitate both students and native speakers’ assignment and not to burden participants with irrelevant information (see Figure 2 for the list of topics). The Erasmus Students - who were not familiar with an institutional virtual learning environment - were given a 30 minute training session on how to access, use and maximise the forum. The asynchronous communication task was open and not prescriptive, the only clear requirements being that the Irish students’ target language (French) was used at all times in the exchanges and that a minimum of six messages were posted by each participant over the course of the on-line task with no constraint of frequency or length. Figure 2. Topics of discussion (snapshot of the virtual platform). As previously mentioned, the Irish students had to post their project work on the discussion forum and start the exchange by asking their Erasmus partner a (controversial) question on their chosen topic. Participants were free to express their views and opinions and the dialogue was not restricted to the topic selected. Students could also read other dyads’ postings but could not join their conversation. In the closing stages of the project, students were asked to give their overall impression of the online exchange experience and explain whether or not they had changed their views on the topic after their online exchange. It is important to note that even though the teacher/moderator involved in the project had full access to students’ postings, she never directly intervened in the exchanges. Any communication with the participants (technical support, gentle reminders to maintain momentum etc.) was carried out via email. The assessment of the online task is an integral part of the whole project. The data analysed in this study was obtained through students’ postings (188 messages in total – average length: 250 words) and students’ feedback collected from two sources: i) students' comments on the exchange (as part of the overall project and completed by all students), ii) students' questionnaire (administered two weeks after the end of the project and completed by 7 Irish students and 8 Erasmus students (7 French students and 1 bilingual Italian-French student). A transcript analysis of the 6 (to 8) weeks of interactions -in the 16 dyads- was conducted to examine students’ level of cognitive presence using coding indicators from ‘ The Four-Phase Practical Inquiry model’, as delineated in Garrison, Anderson, and Archer (2001) conceptual framework. The four phases of developing cognitive presence capture students’ thinking processes in the postings and assess their progress (or lack thereof) of their cognitive presence from lower to higher-order thinking. Figure 3 illustrates each phase of the model with examples taken from the current study. During Phase 1, students were able to identify problems and ask questions for further discussion, while in Phase 2, they exchanged ideas and discussed ambiguities. In Phase 3, students began to connect ideas to construct new meanings, often incorporating information from other sources and finally, in Phase 4, students were able to apply new ideas or to critically assess and defend solutions. Pour répondre à tes questions: Je suis d'accord avec tout ce que tu as dit. Cependant, je crois que c'est plus compliqué que ca. Je serais très favorable à une société européenne dans l'avenir parce que je l'ai déjà vue en quelques sortes à Luxembourg. Je crois que Erasmus est la clé de la future société européenne, elle encourage et crée un amour pour l'Europe en nous [�] Si le financement est arrêté, nous allons perdre tout le travail Erasmus a fait jusqu'à présent. Bien sûr, nous pouvons faire quelque chose. Il y a beaucoup de pétitions en ligne! J'ai déjà signé un et je te recommande de le faire aussi! Figure 3. Four-Phase Practical Inquiry Model (adapted from Garrison et al., 2001). The distribution of percentages for each category of cognitive presence shows that the integration phase was achieved by all dyads (16/16) and the resolution phase, by nearly half of the dyads (7/16). These findings suggest that students had progressed into higher- level thinking processes and were engaged in critical reflection; they concur with those of Akyol and Garrison (2011) where ‘the integration phase was found to be the most active’ (p.244). Le dialogue [en ligne] est constructif. Il permet l'ouverture d'esprit, la confrontation de deux façons de pensées. J'estime que cet échange a surtout eu une dimension intellectuelle, outre sa qualité interculturelle. Nous avons aussi parlé sur le système éducatif, l’avortement. Ça m'a permis de réellement réfléchir sur ces questions sociétales. Mon regard sur tous ces sujets a changé. Interestingly, in the feedback questionnaire, 71% of the Irish participants (5 out of 7 students) agreed or strongly agreed that the online task was intellectually challenging while 86% of French participants (6 out of 7 students) agreed of strongly agreed that it was inter-culturally challenging. The results for the Irish students can be explained in part by the fact that in the previous year, they had spent six months in France, Belgium or Luxembourg either for a study-abroad period or for work experience and thus, they might have felt that they ‘knew’ the target language culture. On the strength of the above findings, it could be argued that a number of instructional strategies may have impacted on students’ levels of participation and cognitive interactions. Since the instructor/teacher did not comment on the discussion board, her ‘teaching presence’ fell under the category of "instructional management" as defined by Anderson et al. (2001, p. 5). Her teacher’s role, i n terms of course design, required: i) the careful structuring and integration of the online task, ii) the clarity of the instructions and the marking criteria, and iii) the shared access to previous year online discussion forum; it was felt that this step by step process of engaging students would help them develop a common understanding of the task learning goals and potential learning outcomes (Brindley et al, 2009). Similar to several CMC research studies, the teacher who had a decisive role in the design and implementation of the task became less active -and more ‘responsive’- during the actual performance of the task (Shea et al, 2010). Thus, it can be stated that the instructor had an indirect, albeit significant, influence on the outcome of the discussions (Arnold & Ducate, 2006). The findings presented in this paper are to be taken cautiously due to the relatively small number of participants (32), the nature of the data (i.e., the study is partly based on self-reported perceptions of students), and given the context in which the asynchronous online communication took place (i.e., the participants were university students, quite motivated, with an intermediate to high level of French). Nonetheless, the present study adds to a growing body of research on the added value of CMC on language students’ educational experience. It underlines some affordances of an online discussion forum, namely, providing a challenging and ‘real’ learning space where undergraduate students can develop their critical thinking skills as well as improve their linguistic and intercultural competence. More specifically, results from this study give further evidence that overt teacher facilitation is not always necessary to support students’ advanced cognitive learning (Shea et al., 2010), and thus encourage other language teachers to assess their unique context (Levy & Stockwell, 2006) and establish their online teaching presence accordingly. Akyol, Z., & Garrison, D. R. (2011). Understanding Cognitive Presence in an Online and Blended Community of Inquiry: Assessing Outcomes and Processes for Deep Approaches to Learning. British Journal of Educational Technology, 42(2), 233-250. Anderson, T., Rourke, L., Garrison, D.R. & Archer, W. (2001). Assessing teaching presence in a computer conferencing context. Journal of Asynchronous Learning Networks, 5(2), 1- 17. Arnold, N., & Ducate, L. (2006). Future foreign language teachers’ social and cognitive collaboration in an online environment. Language Learning & Technology, 10(1), 42-66. Bonk, C. & Graham, C. (2006). Blended learning systems: definition, current trends, and future direction. In C. J. Bonk & C.R. Graham (Eds. ), Handbook of Blended Learning: Global Perspectives, Local Designs, pp. 1-21. San Francisco, CA: Pfeiffer Publishing. Brindley, J., Walti, C., & Blaschke, L. (2009). Creating effective collaborative learning groups in an online environment. International Review of Research in Open and Distance Learning, 10(3), 1-18. Comas-Quinn, A. (2011). Learning to teach online or learning to become an online teacher: An exploration of teachers’ experiences in a blended learning course. ReCALL, 23(3), 218-232. Curtis, D., & Lawson, M. ( 2001). Exploring collaborative online learning. Journal of Asynchronous Learning Networks, 5(1), 22-34. Dooly, M. (2010). The teacher 2.0. In S. Guth & F. Helm (Eds. ), Telecollaboration 2.0: Language, Literacies and Intercultural Learning in the 21st Century, pp. 277-303. Bern: Peter Lang. Garrison, D. R., Anderson, T., & Archer, W. (2001). Critical thinking, cognitive presence, and computer conferencing in distance education. American Journal of distance education, 15(1), 7-23. Garrison, D.R. & Cleveland-Innes, M. (2005). Facilitating Cognitive Presence in Online Learning: Interaction Is Not Enough. The American Journal of Distance Education, 19(3), 133-148. Garrison , R. & Kanuka, H. ( 2004). Blended learning: Uncovering it transformative potential in higher education. The Internet and Higher Education, 7(2), 95-105. Hanna, B., & de Nooy, J. (2003). A funny thing happened on the way to the forum: electronic discussion and foreign language learning. Language Learning and Technology, 7(1), 71-85. Hanna, B. E., & de Nooy, J. (2009). Learning language and culture via public Internet discussion forums. Basingstoke; New York: Palgrave Macmillian. Helm, F. (2013). A Dialogic Model for Telecollaboration. Bellaterra journal of teaching and learning language and literature, 6(2), 28-48. Levy, M., & Stockwell, G. (2006). CALL Dimensions: Options and issues in computer-assisted language learning. New Jersey: Lawrence Erlbaum Associates. O’Dowd, R., & Ware, P. (2009). Critical issues in telecollaborative task design. Computer Assisted Language Learning, 22(2), 173-188. Shea, P., Hayes, S., & Vickers, J. (2010). Online instructional effort measured through the lens of teaching presence in the Community of Inquiry framework: A Re-examination of measures and approach. International Review of Research in Open and Distance Learning, 11(3), 127-154. Why in the world would I want to talk to someone else about my culture? This paper shares the work and observations from a task-based 6-week email exchange project between participants in Spain and the US. Though small in scale, the study offers insights for those interested in telecollaboration but face constraints on multiple fronts. Close examination of the exchanges reveal participants' engagement on multiple levels, including reflection on one's own culture. Keywords: Telecollaboration; email exchange; task-based; intercultural communication; Web 1.0; foreign language. Technology has become an integral part of the modern day classroom. From animated graphics, to YouTube clips, to homework online, to distance learning, technology is not just a novelty in a classroom, but an essential tool, and often a defining measure of advancement. Yet, the vast array of technology has created a unique challenge. Since complex tasks are often associated with implementation of complex technology, people often hesitate before diving into tech-heavy pedagogies. Telecollaboration is such an example. Telecollaboration creates a “virtual intercultural interaction and exchange with partner classes” for learners in “geographically distant locations” (UNIcollaboration, n.d.). Telecollaboration frequently takes place in institutions with the means and the will to support such projects. As a teaching tool, it often involves entire classes of students. Many individual instructors, though interested in telecollaboration, feel daunted by the logistics of coordinating teams of students and having to navigate the technology maze. For these reasons, insights gained through the study are worth sharing as this was the investigators’ first foray into telecollaboration. For the investigators, the project was a success, largely due to the small sample and well-defined time frame – all a consquence of practical constraints and not research intent. But the project’s moderate success bolsters the claim that a small-scale design is important for the successful planning and implementation of a telecollaborative project for the first time (Coffman, 2009). In the 21st Century, it is imperative that foreign language instruction promotes intercultural competence and language learning (Elola and Oskoz, 2008). Intercultural competence “involves the development of the learners’ ability to interact with members of other culture while being aware of differences and similarities and preventing overemphasis on foreignness or stereotyping” (p.454). It has been suggested that immersion offers best opportunities for enhancing cultural competence. Yet immersion is not available to all students; instructors alone cannot adequately address the nuance and diversity of a culture. This is when technology-mediated communication can allow students to “access updated, authentic cultural materials and . . . communicate with native speakers of the target language” (Elola and Oskoz, 2008, p. 455). Indeed, virtual learning may be one of the positive outcomes of the Internet Revolution. As the Internet gains greater penetration, barriers to communication between peoples over vast geographic distances have all but disappeared. “As of 2007, more than 50% of the population in 35 countries had access to the Internet” (Miniwatts Marketing Group, 2007). Email, one of the earliest utility tools, has become ubiquitous. Because of email’s availability and familiarity, telecollaboration via email, as a learning tool, can be set up quickly by instructors alone, and requires minimum additional institutional involvement. Email-based telecollaboration has several additional unique advantages to second language (L2) learners. It allows direct encounters between L2 learners and native speakers, exposing L2 learners to authentic use of language. It allows time for reflection, introspection, and deliberate engagement – all key to critically learning and analyzing others’, as well as one’s own, cultures. The idea of creating authentic virtual communication situations for language learning is not new. Durboraw (2002) set forth a practical model for establishing authentic communication situations with non-threatening atmospheres, in order to lower students’ affective filters and allow students to critically analyzed and discussed the practical aspects of learning a language and culture other than their own (2002). In their study, Klein and Solem (2008) analyzed online collaboration vis-á-vis students’ learning of geography and their appreciation for cross-cultural perspectives. The positive link their research found has significant implications to the teaching and learning of foreign languages and cultures. LaJoie, Garcia, Berdugo, Márquez, Espíndola, and Nakamura (2006) demonstrated how a “community of inquiry” created in a virtual classroom had a positive effect on learning and critical thinking. Fernández Dobao and Palacios Martínez (2007) observed the key role communication strategies (CS) played in expressing and negotiating meaning in face-to-face interactions, highlighting the importance of social interaction in language learning. As “intercultural communicative competence” surpasses “communicative competence” in foreign language teaching, “engaging learners in collaborative project … with members of other cultures has been identified as being an authentic and effective way of preparing learners for the complex yet enriching experience of foreign language and culture learning” (O’Dowd, 2007, p. 3). RQ1: Is an email exchange an effective method to foster “the complex yet enriching experience of foreign language and culture learning” as O’Dowd (2007) predicted? RQ2: Can students learn how to critically analyse and discuss cultural aspects of a language other than their own (Klein & Solem, 2008) through an email exchange? RQ3: Do participants gain knowledge of another’s culture through the lens of a native speaker through an email exchange? A total of five participants made up three intercultural partnerships in the 6-week email exchange. Each partnership consisted of one L2 Spanish learner from a US institution and one L2 English learner from a Spanish institution. Participants received individualized weekly prompts from the investigator to complete a task in the target language (TL). The tasks were developed to be realistically doable (Coffman, 2009). The focus of the exchange was on task outcome, rather than accuracy of language forms. Participants were instructed to always use their nicknames and copy the investigator in all emails. Participants were encouraged to ask questions, share personal anecdotes, and have fun. There were no other restrictions on the exchange. Partners alternated weekly in initiating the exchange. Before and after the 6-week email exchange, participants completed a survey. Participation in this study was conducted outside their normal classwork. The two L2 Spanish learners were an average age of 21.5 years whereas the three L2 English learners were an average age of 21.7 years. One L2 Spanish learner partnered with two different L2 English learners. The pre-survey, completed on surveymonkey.com, consisted of 24 questions. Each participant noted prior knowledge and perceptions of the L2 culture and their expectations of the study. After completing the pre-survey, each L2 Spanish participant was partnered with an L2 English participant for the exchange. Participants then received weekly detailed instructions to discuss a specific cultural topic. Table 1 below displays the weekly topics and the roles (initiator or responder) each L2 participant played over the course of the 6-week period. New Year’s Eve and New Year’s Day in the U.S.
At the end of the 6-week exchange, participants completed the 31-question post-survey on surveymonkey.com, which fielded their newfound knowledge, changes in perceptions of the L2 culture, problems encountered, and reflections on the intercultural collaboration. Participants made it clear they were aware of their lack of, and often inaccurate, knowledge of the L2 culture. They acknowledged “stereotypes” about the other culture and finger-pointed TV shows and movies as the culprits. Participants’ “blind spots” were also evident, such as the superficial cultural icons they conveniently associated with the L2 culture. L2 Spanish participants associated Spain with “drinking” and “drunk people”. L2 English participants associated Americans with food and drink, most notably “red plastic cups” (disposable cups used at parties). Notably, participants also expressed interest in going beyond their stereotypes and preconceptions and learn more about the L2 culture. Emails became more relaxed in tone over time. The frequency of the exchange also increased over time. Similarly, formality decreased with time, with participants using real names, despite instructions to the contrary. For a mere 6-week exchange, such rapid shift is significant. It appears, even in an email exchange, participants felt the need to drop their adopted persona (nickname), and establish an authentic connection with their partner. These unexpected behaviours are beyond the scope of the present study, but deserve further analysis. Personal relationships developed during exchange and the interactions encouraged L2 learners to further explore the L2 culture. Participants gained new information and an enhanced awareness of the misrepresentations of cultural truths. Students became more mindful of the L2 culture, and through their partners’ lenses, participants made comparisons between the other culture and their own. There was also increased curiosity of culture and interest to know more. The investigators concluded that telecollaboration, even a small-scale project, offers an invaluable opportunity for participants to effectively foster cultural learning (RQ1). They also deduced that email exchanges do afford students the opportunity to learn and exercise critical thinking skills in analysing and discussing cultural aspects of a language other than their own (RQ2) as seen by the enhanced awareness of the L2 culture through the exchange. Finally, the participants gained knowledge of another’s culture through the lens of a native speaker because of the telecollaborative encounter (RQ3). The mere contact with their partners allowed participants to gain a new perspective (Helm & Guth, 2010). As per the investigators’ experience, there are key components for a successful email exchange and its successful implementation for the L2 classroom. Telecollaboration can be set up for any level, with any number of students. As with all human activity, flexibility and an open mind are fundamental to a successful exchange. Much can be learned through “irregular” situations. The uneven number of participants in this project, for example, afforded investigators a unique look into the mind of one participant engaged in two exchanges simultaneously. Despite the key role technology plays, the human interaction in telecollaboration is the most important piece. It is vital to leave plenty of space for the unexpected. One participant in the study gradually revealed her parents’ Chinese heritage. This enlivened and enriched the exchange and served as a reminder of the complex, multicultural world in which we live. The role of the instructor(s) is important, both in introducing participants, giving instructions, and in maintaining the on-going exchange. After introductions, participants needed to be frequently reminded to initiate, respond, and to copy the instructors on their emails. Instructor’s active involvement was particularly important at the beginning of the process, but remained necessary throughout the exchange. Instructions (and their timing) must be handled deliberately and judiciously so as to avoid interference. In the absence of face-to-face interaction, one must reserve judgment and do one’s best to allow interactions to take place on participants’ terms. The small scale made it possible for the investigators to make individual judgment calls on nudging or waiting when emails were not forthcoming. Delay in responses occurred for reasons other than lack of interest. This was evident, because when participants resumed writing, they apologized sincerely and warmly, which led to more spontaneous personal exchanges. A large number of participants would have put greater demand on the instructor on similar matters. Although a large sampling size is preferred for data analysis, starting small is key when first planning and implementing telecollaboration (Coffman, 2009). Technology integration aside, smaller scale projects make for better learning opportunities for instructors and students. Answer to the title question, “Why in the world would I want to talk to someone else about my culture?” became clear when investigators saw evidence that learning took place on many different levels in this email exchange. Investigators were struck by the ease with which students took to the medium and opened up to their partners. However, seemingly straightforward exchanges via a straightforward medium are multi-layered, complex, rich, interesting and human, and impossible to be reduced to fit into existing theories. Therefore, it is critical for L2 educators to engage in telecollaborative efforts in and out of the classroom so that students understand the importance of talking to someone else about their culture. In carrying out this study, we received assistance from the following colleagues, who deserve our thanks, Ronna Feit, Ph.D. and María Luisa García Bermejo, Ph.D.
Coffman, T. (2009). Engaging students through inquiry-oriented learning and technology. Lanham: Maryland: Rowman & Littlefield Education. Durboraw, C.A. (2002). Border crossings: Computer-mediated discussions linking English learners in Mexico with Spanish learners in the United States. The Delta Kappa Gamma Bulletin, 68(3), 31-42. Elola, I. and Oskoz, A. (2008). Blogging: Fostering intercultural competence development in foreign language and study abroad contexts, Foreign Language Annals, 41(3), 454-477. Fernández Dobao, A. M., & Palacios Martínez, I. M. (2007). Negotiating meaning in interaction between English and Spanish speakers via communication strategies. Atlantis, 29(1), 87-105. Helm, F. & Guth, S. (2010). The multifarious goals of telecollaboration 2.0: Theoretical and practical implications. In S. Guth and F. Helm (Eds.) Telecollaboration 2.0: Language, Literacies, and Intercultural Learning in the 21st Century, pp. 69-106. New York: Peter Lang. Klein, P. and Solem, M. (2008). Evaluating the Impact of International Collaboration on Geography Learning. Journal of Geography in Higher Education, 32(2), 245-267. LaJoie, S. P., Garcia, B., Berdugo, G., Márquez, L. Espíndola, S., and Nakamura, C. (2006). The Creation of Virtual and Face-to-Face Learning Communities: An International Collaboration Experience. J. Educational Computing Research, 35(2), 163-180. Miniwatts Marketing Group. (2007). Top 35 countries with the highest Internet penetration rate. Retrieved May 21, 2007, from http://www.internetworldstats.com/top25.htm. O'Dowd, R. (2007). Introduction. In R. O’Dowd (Ed.) Online intercultural exchange: An introduction for foreign language teachers, pp. 3-16. Clevedon, UK: Multilingual Matters Ltd.
UNICollaboration (n.d.). International Conference: Telecollaboration in University Foreign Language Education. Retrieved May 16, 2014, from http://unicollaboration.unileon.es. This paper examines the effectiveness of a mobile assisted blended learning scenario for pronunciation in Korean language. In particular, we analyze how asynchronous oral communication between learners of Korean and native speakers via "kakaotalk" (an open source mobile phone application) may be beneficial to the learner in terms of pronunciation. Our methodological approach is based on task resolution (Ellis, 2003) in peer-to-peer collaborative settings and the spaced repetition concept (Ebbinghaus, 1885, cited by Dempster, 1988). The outcomes of our study show that the learners appreciated the possibility to interact with native speakers but most of them preferred synchronous communication for training their pronunciation skills. Keywords: Mobile learning, oral skills, pronunciation, task, intercultural awareness. The LANSAD foreign language centre at the Université Stendhal Grenoble (France) provides conversation classes in 15 languages. The purpose of these classes is to give students of all disciplines the opportunity to "exercise and improve oral communication skills". The courses include face-to-face classes and individual practicing on the university's e-learning platform Esprit . Students are asked to prepare the face-to-face classes with tasks and exercises based on authentic material provided on the platform. In doing so, the students can collaborate with their peers and ask for support from the tutor on the online discussion forum. Since its foundation, the Lansad centre has aimed to initiate and promote a reflective process in order to improve implemented teaching models and to produce guidelines for best practices in foreign language teaching (Masperi & Hamez, 2013: 13). In the fall semester of 2013, the Lansad centre opened a conversation class for beginners (A1- A2 CEFR) of Korean as a foreign language. Six French students attended four face-to-face sessions with their teacher and did their training on the Esprit platform. Following the results of the analysis of the fall semester (Clot, 2013-2014 forthcoming), all the students reported being satisfied with the purpose and content of their Korean conversation class. The students particularly appreciated the fun aspect and the authentic use of the language (e.g. speed-dating with a group of Korean students) which was motivating and helped them learn easily. However, the students also pointed out that they would have wished for more systematic input with regards to grammar, pronunciation or vocabulary and more sessions which they considered to be helpful for a more noticeable progression. Asked about their learning behaviour, our students mentioned the use of applications and the Internet that is accessible via their tablets or smart-phones in order to look up vocabulary and to listen to word pronunciation. We would like to point out that not only did all of our conversation class students own a smart-phone, but that they also used the KakaoTalk  application regularly to exchange text, audio and video messages with their friends. Language learning in collaboration with a native speaker has been reported as highly beneficial in particular in tandem settings where two native speakers cooperate in order to learn from each other. According to Helmling (2002), tandem learning is a contractual situation which binds both partners to respect the principles of reciprocity, i.e. mutual support and autonomy, i.e. learner responsibility of content and method. As many Korean students learn French at the Université Stendhal Grenoble, we decided to take into account these principles for the design of our conversation class. Our target group is mainly composed of elementary learners of Korean and French. At an early stage of language learning, we consider that training one's memory is important to progress rapidly. We therefore refer to the spaced repetition concept (Ebbinghaus, 1885, cited by Dempster, 1988) which allows learners to memorize items such as vocabulary or sounds effectively. This concept is based on the spacing effect which implies that people remember items more easily when they are studied a few times in increasing intervals over a long period of time. In order to train the skills mentioned above, the conversation class is based on the task based teaching approach (Ellis, 2003). In particular, the topic the students worked on was based on songs which were supposed to enhance the learner’s performance in language learning. As Guimbretière (1994: 84, cited by Zedda, 2005: 4) states, "the advantage of using songs in language teaching is a powerful tool to motivate learners in the first place. Through songs, learners can perceive new sounds more easily. Moreover, music and rhythm can free learners of certain communication apprehensions and can thus lead them to speak more fluently." (our translation and bold highlighting). The use of communication technologies in education and especially in language learning is becoming more and more common and the benefits in terms of learner autonomy and customization of learning are regularly pointed out by researchers. We would like to mention a trend in the use of communication technologies which in our view might be promising for language learning and to which researchers refer to as mobile learning (Kukulska-Hulme & Shields, 2008). A large survey conducted in June 2012 by the CREDOC (Centre de recherche pour l’étude et l’observation des conditions de vie - French observatory and research center on living conditions) revealed that 88 % of French people use a web-enabled cell phone (Bigot & Croutte, 2012 : 9). Nearly 16 million people in France own a smart-phone most of whom are between 18 and 24 years old (op.cit. : 37). Whereas exchanging short text messages is one of the most common practices in the everyday use of mobile phones, many smart-phone owners also use their phone to browse the Internet (79%), to check their emails (65%) and to download applications (63 %) (op.cit. : 47). According to our own observations, more and more people seem to use their smart-phones or tablets to access the Internet in order to update their knowledge, to exercise the brain and to learn a language. The participating students will get more familiar with sounds and stress and be able to memorize vocabulary and colloquial expressions more easily. The participants will develop strategies to understand spoken language. The students will develop intercultural awareness and cultural insight. Asynchronous communication might contribute to becoming more self-confident (Kim & Mangenot, 2009) and thus to speaking more naturally. For the summer semester of the academic year 2013-2014, we proposed a didactic scenario based on the concept of telecollaboration which refers to "the application of online communication tools to bring together classes of language learners in geographically distant locations to develop their foreign language skills and intercultural competence through collaborative tasks an project work" (O'Dowd, 2011). Mangenot & Nissen (2012) point out that telecollaboration can include distance learning (e.g. Cultura) and/or blended learning (e.g. Français en première ligne). As the setting of the LANSAD conversation classes follows blended learning principles (Quintin et al., 2009), we opted for a blended solution for our Korean telecollaboration class scenario. Considering this, the French students work on tasks focusing on linguistic aspects during the face-to-face conversation class. Incorporating distance learning, they cooperate on a one-to-one basis with Korean native speakers using their smart-phones in order to continue working on their tasks anytime and anywhere (Kukulska-Hulme & Shields, 2008). The Korean students were actually attending French classes at the CUEF French language centre of the University Stendhal Grenoble and participated voluntarily in the project. The Korean students were selected according to their motivation and level in French as they were supposed to use French as a lingua franca when communication with their French tandem partners. For the exchange was to be beneficial for both partners, all students were invited to choose songs, i.e. French songs for the Korean students and Korean songs for the French students. The French students were then asked to draw by lot a French song to which their tandem partner was associated. According to the set objectives of our conversation class, the task we wanted the students to work on had to include socio-cultural and linguistic aspects of language learning and also be motivational and fun. We therefore decided that the task should be a karaoke session at the end of the semester. In fact, Karaoke bars, where friends or colleagues gather in separate rooms to sing songs and have fun together, are very popular in Korea. As pointed out by Rousse-Marquet (2012), K-pop (Korean pop) has recently become quite popular in Europe and especially among the young generation in France. Learning Korean with pop songs could therefore be motivational for our French students and also beneficial for developing their overall language skills as mentioned earlier (Guimbretière, op.cit.). The outline of the working plan is as follows. During the first session, the French students work with their teacher on a song in order to learn techniques to identify the chorus line and to learn how to pronounce the words and expressions the song contains. While listening to the song, the students were told to recognize words. The teacher then recorded the pronunciations with a voice recorder of whoever would identify a word. In order to prepare the second face-to-face session, the students were asked to practice their pronunciation and to send three Korean pop songs of their choice to their teacher. In the meantime, we selected Korean students in cooperation with the teacher of French. Then we gave them instructions of how to proceed and gave them advice on how to learn in tandem with their partners. During the second face-to-face session, the French students compared their recordings with the original song and repeated the pronunciation of each word they had identified. Finally, all the students sang the chorus line together. The French students also picked the song and phone numbers related to their tandem partner. Using distance learning, the students worked on their own songs with their tandem partner in order to practice pronunciation. The peer work was carried out asynchronously and supported by the use of the KakaoTalk application as it offers free voice and video messaging as well as text chatting features. The third face-to-face session was dedicated to individual tutoring. We spent time with each student in order to discuss their learning experience and difficulties they had encountered. We also talked about their learning progress and gave advice for the last distance period to come. The Korean students got the same feedback in a special session we held together with their French teacher. The last face-to-face meeting was dedicated to the karaoke session where the French and Korean students were supposed to meet for the first time in person. We provided a karaoke machine to enable the students to sing the song with their partners, i.e. one sings the verses of the song and his or her tandem partner sings the chorus line. We also asked the native speakers to evaluate the quality of the performance of their peer students regarding their overall presentation and pronunciation. This study is based on an analysis of a blended conversation class in which seven French and seven Korean students participated. The French students had an estimated A1.2 – A2.1 (CEFR) level in Korean whereas the Korean students were ranged at an estimated A2.1 (CEFR) level in French. Our corpus consists of the French students' testimonies we collected during the feedback session and the written responses of the French and Korean students to a questionnaire we asked them to fill out during the last session. The questions referred to the following issues : i) the satisfaction of the content of the conversation class ii) the learning strategies the students experimented with iii) tandem collaboration iv) their feelings with the mobile blended learning scenario and v) suggestions. In order to objectify the results, we based our analysis method on the principle of "data triangulation" (Van der Maren, 1999). Regarding the learning strategies of listening and pronunciation the students applied, our analysis of the data show that most of the French students mentioned that they referred to written text in order to identify lexical units associated with the sounds they were listening to. Three learners listened to their song several times while reading the lyrics before recording themselves. Three other students first listened to their song, then repeated orally what they were listening to, and finally recorded themselves. One student told us that he or she listened to the song first, then transcribed the lyrics using Romanization before reading the transcription aloud. This student finally recorded his or her reading several times before submitting it to his or her tandem partner. These responses all reveal that students usually repeated several times and revised their recordings before submitting their oral production which might be helpful for practicing pronunciation. According to the questionnaire, all students used the KakaoTalk application to record their voice and send the recordings to their tandem partners. One of the French students noted that "I can record whenever I want and the fact that someone answers and gives me feedback later is really motivating". This kind of statement might indicate that mobile learning is being utilized. However, the use of KakaoTalk failed when the students were asked to cooperate from a distance with their tandem partners. Six out of seven French students stated that they had met their Korean tandem partner several times in person in order to work on their pronunciation. Even if the Korean and French students appreciated the possibility to record their voice and to communicate asynchronously with their partners via KakaoTalk, they preferred to meet their partners face-to-face in order to work on the accuracy of their pronunciation. The students mentioned that they communicated via text chat but felt uncomfortable when it came to recording the correct version and to give explanations and advice orally. They also stated that they missed not having instant feedback on their pronunciation when working asynchronously with KakaoTalk. Moreover, according to the French students, the explanations of some Korean tandem partners would not have always been easy to understand. Thus, meeting with their tandem partners in person allowed them to work more intensively on their pronunciation and to communicate more easily. In addition, some students mentioned that they not only worked on their pronunciation but also on the meaning of the lyrics. Only one French student stated having deliberately avoided meeting with his or her Korean tandem partner and said that "as we don't know each other I am less shy [to exchange audio recordings]." Interestingly, nobody mentioned the use of the video recording feature of KakaoTalk with which the students could have filmed their articulatory apparatus in order to give advice on pronunciation. This might be either due to the fear of exposing one's shortcomings to what the student above mentioned, or due to technical reasons. Indeed, one French student wrote that it took quite a long time to transfer video files. Another student noted that the video recording time was very short which didn't encourage him or her to use the video feature. Regarding the issue of intercultural learning, a French student mentioned that "meeting with a person whose mother tongue is different, who comes from a country with different traditions and where the lifestyle is different from one's own, allows me to learn about the culture and its people and really motivates me to visit the country and learn the language. I could talk about everything with my tandem partner. We were both quite curious and eager to get to know each other and to learn about each other's culture." From this statement, we may infer that our telecollaboration scenario contributed to some extent to a greater awareness of the self and allowed the students to reflect -at least to some degree- on their own cultural background. Finally, most participants of the Korean conversation class stated being satisfied with the learning modality. They said that it allowed them to learn several colloquial expressions in Korean, to improve their listening comprehension skills and to practice their pronunciation. They also stated having learned cultural aspects while having a lot of fun. In short, they found this modality "practical, fun, educational, and motivating". All in all, the students seemed to be satisfied with our conversation class. In particular, they appreciated the fact that they could interact with native speakers, which was seen as beneficial in terms of both language learning and learning about cultural aspects. The self-assessments during the feedback sessions and peer reviews by native speakers actually revealed an increase in the quality of their pronunciation. Nevertheless, we have identified several aspects which we think deserve more detailed analysis. For organizational or ergonomic reasons, most students preferred to meet their tandem partner in person in order to work on their pronunciation. It appears to be more effective for them to receive feedback immediately on their pronunciation practice. Face-to-face meetings to exchange explanations related to the correction seem also to be preferred by the students as this would allow a better understanding of word definitions and meaning, and thus ensure the right understanding of each other. Nevertheless, the possibility to record one's voice and to practice pronunciation alone was generally appreciated. The interviews we conducted during the feedback session have revealed that students had experimented with different techniques to learn how to pronounce and to overcome difficulties. For instance, some students decided not only to communicate asynchronously but also to meet with their partners physically. From that, we may deduce that our telecollaboration setting promotes the learner's empowerment to some extent. Although the tandem partners seemed to communicate and to cooperate quite a lot, which we had supposed to promote intercultural learning, the statements of the students regarding this are fairly implicit. It may be that the duration of the exchange was too short to make students become aware of intercultural aspects (attitudes, behaviours, ways of doing...) or that the evaluation method using mainly written questionnaires was not conducive enough to generate deeper meta-cognitive reflection. A priori, such thinking does not occur naturally but requires support from the tutor or has to be explicitly practiced with specific tasks for example. If we were to repeat the experience, we would advocate keeping the possibility to do recordings which was seen as a great way to practice one's pronunciation and language production. However, we would reconsider the peer work element and particularly the way students collaborate for pronunciation practicing. Finally, we consider it to be necessary to explain intercultural learning and would introduce a logbook, in addition to accompanying intercultural reflection through feedback and peer group sessions with the tutor. Bigot, R. & Patricia, C. (2012). La diffusion des technologies de l’information et de la communication dans la société française. CREDOC (Centre de recherche pour l’étude et l’observation des conditions de vie), October issue. Clot, G. (forthcoming). Bilan sur les ateliers de conversation. LANSAD - l’Université Stendhal Grenoble 3. Dempster, F.N. (1988). The spacing effect: A case study in the failure to apply the results of psychological research. American Psychologist, 43(8), pp. 627-634. Helmling, B. (Ed.) (2002). L'apprentissage des langues en tandem, Didier: Paris. Rousse-Marquet, J. (2012). La K-pop, phénomène musical coréen. Ina Global (La revue des Industries créatives et des médias), retrieved from http://www.inaglobal.fr/musique/article/la-k-pop-phenomene-musical-coreen. Last accessed 18 April 2014. Kukulska-Hulme, A. & Shield, L. (2008). An Overview of Mobile Assisted Language Learning: from content delivery to supported collaboration and interaction. ReCALL, 20(3), pp. 249-252. Mangenot, F. & Nissen, E. (2012). La télécollaboration au service de l’apprentissage des langues. Séminaire “le numérique au service des langues” , Besançon, 2-3 July 2012. Masperi, M & Hamez, M.P. (2013). Introduction: Apprendre à s’autoformer en langues- approches créatives et outils numériques. In Masperi, M. (Ed.) (2013). Les Langues Modernes: Apprendre à s'autoformer en langues : approches créatives et outils numériques, APLV, pp. 11-16. O'Dowd, R. (2011). Intercultural communicative competence through telecollaboration, in Jackson, J. (dir. ), The Routledge Handbook of Language and Intercultural Communication, Routledge, 342-358. Quintin, J.J. et al. (2009). Préparer les ateliers de conversation : mémo à l’attention des tuteurs concepteurs des fiches d’atelier de conversation. LANSAD - l’Université Stendhal Grenoble 3. Van der Maren, J.M. (1999). La recherche appliquée en pédagogie: des modèles pour l’enseignement. Bruxelles: De Boeck. Zedda, P. (2006). La langue chantée: un outil efficace pour l'apprentissage et la correction phonétique. Les Cahiers de l'Acedle, 2, pp.1-26. Combining Skype with Blogging: A chance to stop reinforcement of stereotypes in intercultural exchanges? This papers looks into whether combining Skype, blogging and class discussions reinforces or refutes stereotypes. The hypothesis was that some students do not have an adequate chance to reflect on their skype experience and course content. To see if students have made improvements in reducing stereotypes, the Standards for Foreign Language Learning: Culture will be used to evaluate their blog entries. In addition a survey will be given at end of the semester to analyse the student's perspective of their own learning. Keywords: Intercultural communication, stereotypes, blog, cultural metaphor, skype. Tandem has been used successfully for many years at universities as a means of improving language skills. The Modern Language Center at Leuphana University started offering Tandem in winter semester 2009/2010 and Teletandem in 2010/2011 for credit points. These courses have been part of the curriculum since then. The purpose of this paper is to look beyond the language skills focus of Tandem and investigate how skyping as well as in-class blogging can help stop the reinforcement of stereotypes which can occur in Teletandem. Godwin-Jones (2007) sees telecollaboration as a good way to avoid oversimplified or tourist-like treatment of culture found in many text books. However, he points out that communicating, whether face-to-face or virtually, does not promise effective communication. He sees reflection as a way to prevent cultural misunderstandings. According to a Europe-wide study from the INTENT project team about online international exchanges the study, only 5% thought stereotypes had been reinforced via exchanges, and 26% were not sure (Guth, Helm, & O’Dowd, 2012, p. 28). Yet the participants’ responses to “By doing my online exchange(s) I confirmed what I thought about members of other cultures.” were divided up almost equally between agree, undecided and disagree (Guth, Helm, & O’Dowd, 2012, p. 47). Additionally, García and Craprotta (2007) see ‘synchronous exchanges’, i.e. via Skype, as ‘unreflected’ because an immediate answer is required; however, asynchronous communication, e.g. online forums for Cultura, allows for ‘reflection and analysis’. These authors mirror my experience (Kirschner & Mißfeldt 2013) that face-to-face contact does not guarantee reflection. Therefore, a blogging component was added to the course Blog-Versity. Regarding the benefits, Sideka and Yunusa (2012) view blogging as able “to support reflection and communication in realistic circumstances”. They describe the blogging process as being stimulated by new knowledge, understanding the text in this case, and thinking about what has been learned and how to put it in their own words. This is in line with Dewey. However, blogging does not always have positive associations. Scharma and Xie (2008) and Helm, Guth, & Farrah (2012) both mention unfamiliarity with technology or poorly functioning technology as a means of frustration. Additionally, Sharma and Xie (2008) and Hosack (2004) pointed out that lack of privacy could also contribute to negative associations. Therefore, a blog patterned after WordPress and stored on and supported by the Leuphana University server as well as pseudonyms were chosen. According to Lee (2011), “Critical reflection, however, relied on the teacher’s guidance and feedback”. Since blogging alone is not always sufficient, cultural metaphors (Gannon 2010) and feedback were used during class discussions. In Metaphors We Live By, Lakoff and Johnson (1980) popularized metaphors, suggesting that humans perceived the world through metaphors. Gannon then adapted this idea to the cultural metaphor “which is any activity, phenomenon, or institution that members of a given culture consider important and with which they identify emotionally and/or cognitively… As such the metaphor represents the underlying values expressive of the culture itself.” (Gannon, 2010, p. XV). This notion also supports reflection and careful consideration. Additionally, metaphors are used to show an abstract or unfamiliar idea in a more understandable way. Singh (2010) states that it is “the constructivist view, which asks the listener or reader of the metaphor to go beyond the literal in order to create his or her own understanding of reality.” This implies that there is a wide variety of ‘realities’. In my experience, students often view cultural terms used by Hofstede, Hall and Trompenaars in a bi-polar way. This is not intended but can be the case sometimes. In order to avoid this pitfall, students blogged about cultural metaphors. In winter semester 2013/2014, the participants of the Blog-Versity course (level B2.2) at Leuphana and the participants from University of Minnesota course German 3011(level B1) skyped three times within 5 weeks. Blog-Versity is a course where advanced writing skills are improved via the acquisition of information about culture and intercultural communication competencies. Data was only gathered for Blog-Versity. In between the three Skype assignments and continuing throughout the semester, students blogged about their Skype findings and observations. The course curriculum included detailed information and discussions about terminology (e.g. Hall, Hofestede, Trompenaars, Schwarz), communication, intercultural communication, cultural competencies and stereotypes (final 3 sessions). All Skype exchanges were finished before the topic of stereotypes was discussed. First Skype session: How do students see the world? Third Skype session: Globalization and Culture – How has globalization changed culture? The topics were kept vague to allow students to develop a conversation naturally. The blog entries following the Skypes had to include both the German and American viewpoints. In week 6 and 9, students were asked to create a metaphor, first about Germany and then about the US. They later blogged about cultural metaphors, and their last blog entry involved assessing these entries for any ‘stereotypical’ wording or comments. After completing workshops on technical blogs and writing, students completed three collaborative writing tasks as well as thirteen blog entries throughout the semester. Most of the blog entries were started and then completed within the week. Group assignments were completed in class. Students received feedback from the instructor about organization, grammar and sentence structure. Content was never commented on unless it was off topic. For this paper, the National Standards in Foreign Language Education in the culture section is used. It lists 2 standards: “Standard 2.1: Students demonstrate an understanding of the relationship between the practices and perspectives of the culture studied” and “Standard 2.2: Students demonstrate an understanding of the relationship between the products and perspectives of the culture studied” (http://www.actfl.org/node/192). Like many standards, this is more of a guideline with a wide range of possibilities; therefore, more specification was necessary. In Shrum & Glisan (2010) quoted in Troyan (2012), they specify: “Students identify, examine and discuss connections between cultural perspectives and socially approved behavioral patterns” for 2.1 and “Students identify, discuss, and analyze such intangible products of the target culture as social, economic, and political institutions, and explore relationships among these institutions and the perspectives of the culture” for 2.2. Using the Standards for Foreign Language Learning as a basis, the blogs about the first and last Skype assignments were evaluated for topics of culture associated with these standards. Although there are 5 parts to this scale (communication, cultures, connections, comparisons, and communities), only the cultures section was used for the sake of brevity. Additionally, a class survey about the students’ Skype experience was done in week 4 (Skype) and 11 (cultural metaphors) where students were asked about similarities and stereotypes respectively. The first Skype assignment was set up so that students could identify what they view as important. By discussing both US and German views and trying to find similarities or differences, they also had to examine the connection between two cultural perspectives and behaviours. Interestingly enough, students not only listed cultural practices (self-responsibility, building friendship, typical university social events) but also included cultural products (e.g. political systems, free trade, social inequality, economic power and responsibility.) All but 4 entries mentioned both the practices and products from the very beginning. “U.S. do not reflect as much as students from other countries because they see their own country as a well-structured place, they do not have a varied comparison to other countries like Europe and get only one sided information through a powerful news station.” Blogger Charly. “Similarities can be found as well as some differences due to the country’s history, the educational system and the geographical location of the countries.” Blogger Ladida. “Canadians and Americans are similar because they both speak English.” Blogger Butterfly. When stereotypes are mentioned, most students look for a reason. Although this does not guarantee the reasons are free of stereotypes, at least students are trying to find an answer. However, one drawback of the National Standard involves the difficulty of deciding when practices become products and vice-versa. The first class survey in week 4 mirrored the topics mentioned. Only a few cases of stereotypes were mentioned. When asked why they found more similarities than differences, the students offered several hypotheses. Many believed this was due to either the types of questions asked, or that they were in a similar situation i.e. college students. Others thought that looking for common ground was more typical when getting to know someone. A few even posited that they might not always have understood indirect disagreement. “It appears rather inconvenient when one movie-making elite has the same cultural background and decides where to lay the focus.” Blogger X. “Hearing (Skype partner’s name) saying all the negative things about the world, I was surprised.” Blogger Palim. “I thought that despite my appreciation of the Americans, I do not like their politics either.” Blogger Budoka. In most cases when students mentioned a negative trait, they used hedging techniques (seems, appears, could be, perhaps). Others had their stereotypes deconstructed, e.g. blogger Palim and Budoka. Again the problem of product vs. practice was an issue. The final survey in week 11 and the last task of assessing their cultural metaphors of Germany and the US in week 14 showed that most of the reduction in stereotypical language and thoughts took place without the students realizing it. In the survey, students were asked: “What surprised you the most while skyping?” Of the 17 students present, 11 students said that their partners criticized the US government. They discovered that their partners were open-minded about religion, knew a lot about Germany and not all of them were against gun control. All of these aspects are typical stereotypes that many Germans have about the US. When students were asked which stereotypes had been refuted, they could not come up with an answer. After having this discrepancy pointed out to them, they realized that their stereotypes had been refuted. Figure 1. Results of survey completed by students. Using only one of the five points in the National Standards in Foreign Language Education did not provide an adequate measurement. However, this has more to do with its application in this study than the actual standard. This approach was chosen due to the tight time schedules instructors face. It underscores the need for a quick and easy way to check cultural competencies. Nonetheless, “the assessment of ICC development is “not a visible process, nor is it a linear process” (Helm, 2009, p. 101). Additionally, “it emerges slowly over time” (Troy, 2012, p. 25). Despite the lack of success with using a singular step in the National Standards, the various surveys, reflections, and writings show that the students made an improvement by using less stereotypical language and thoughts. Only by writing a blog, taking surveys, and requiring students to occasionally reflect on their thoughts throughout the semester was it possible to see progress in reducing but not eliminating stereotypical reinforcements. Since learning in general requires time, future courses will also need a variety of instruments be it a blog, class discussion or class surveys as well as time for reflections in order to make progress in intercultural understanding. Dewey, J. (1933). How we think: A restatement of the relation of reflective thinking to the educative process. Boston, MA: Houghton Mifflin. Gannon, M. J., & Pillai, R. (2010). Understanding global cultures: metaphorical journeys through 29 nations, clusters of nations, continents, and diversity. (4th ed.). Los Angeles, CA: Sage Publishing. García, J. S., & Crapotta, J. (2007). Models of Telecollaboration (2): Cultura. In Robert O’Dowd (Ed. ), Online Intercultural Exchange: An Introduction for Foreign Language Tearchers (pp. 62-84). Clevedon, England: Multilingual Matters. Ltd.
Godwin, R. (2013). Integrating Intercultural Competence into Language Learning Through Technology. Language Learning & Technology 17(2), 1-11. Retrieved from http://llt.msu.edu/issues/june2013/emerging.pdf. Guth, S., Helm, F., & O’Dowd, R., (2012). University Language Classes Collaborating Online: A Report on the Integration of Telecollaborative Networks in European Universities. Retrieved from http://www.intent-project.eu/sites/default/files/Telecollaboration_report_Final_Oct2012.pdf. Helm, F., Guth, S., & Farrah, M. (2012). Promoting Dialogue or Hegemonic Practice? Power Issues in Telecollaboration. Language Learning & Technology. 16(2), 103-127. Retrieved from http://llt.msu.edu/issues/june2012/helmguthfarrah.pdf. Hosack, I. (2004). The effects of anonymous feedback on Japanese university students’ attitudes towards peer review. In Ritsumeikan Hogaku (Ed.). Language and its universe, pp. 297-322. Kyoto, Japan: Ritsumeikan Hogaku. Kirschner, L., & Missfeldt D. (2014). ‘Theorie und Praxis – Skypen macht‘s möglich. In Regina Mügge (Ed. ), Gekonnt, verkannt, anerkannt? - Sprachen im Bologna-Prozess. 13., Dokumentation der 27. Arbeitstagung 2012, pp. 227-238. Bochum, Germany: Verein z. Förd. d. AKS. Lakoff, G., & Johnson, M. (1980). Metaphors we live by. Chicago, IL: University of Chicago Press. Lee, L. (2011). Blogging: Promoting Learner Autonomy and Intercultural Competence Through Study Abroad. Language Learning & Technology, 15(3), 87-109. Retrieved from http://llt.msu.edu/issues/october2011/lee.pdf. Shrum, J. L., & Glisan, E. W. (2010). Teacher’s handbook: Contextualized language instruction (4th ed.). Boston, MA: Heinle Cengage Learning. Sideka, E., Rahman A. & Yunusa, M. Md. (2012). Students’ Experiences on Using Blog as Learning Journals. Procedia - Social and Behavioral Sciences, 67, 135-143. Retrieved from http://www.sciencedirect.com/science/article/pii/S1877042812053001. Singh, K. (2010). Metaphor as a Tool in Educational Leadership Classrooms. Management in Education, 24(3), 127-131. Standards for Foreign Language Learning: Culture. (n.d.). Retrieved May 15, 2014, from http://www.actfl.org/node/192. Troyan, F. J. (2012). Standards for Foreign Language Learning: Defining the Constructs and Researching Learner Outcomes. Foreign Language Annals (45.S1), 18-40. Xie, Y. & Priya S. (2011). Exploring evidence of reflective thinking in student artifacts of blogging-mapping tool: a design-based research approach. Instructional Science, 39, 695-719. This paper describes a cross-border collaboration between a Russian and a Norwegian University in the English Language field, and how it is made possible by the universities' support � both in terms of strategic plans and funding. The paper shows the goals of the collaboration; to give the students an insight into how English is taught in Russia/Norway and intercultural learning, as well as how this is pursued through telecollaboration and physical mobility. The paper also explains how the physical mobility, as it is the core activity of the collaboration, has led to less telecollaborative activity. Keywords: Cross-border collaboration, Russia and Norway, telecollaboration, physical mobility, intercultural learning, English language. UiT, The Arctic University of Norway, Campus Alta, is located in Finnmark, the northernmost county of Norway. It is Norway's largest county in area (slightly bigger than Denmark), but the smallest in population (only 75 000 people). It borders the Barents Sea in the north, the county of Troms to the west, Finland in the south and Russia in the east. Due to its geographic position many businesses and institutions in Finnmark county have close collaboration with Russian enterprises, especially in the Kola area of the north-west as that is located closest to the common border. UiT, The Arctic University of Norway, is the northernmost university in Norway. It has a total of approx. 12 000 students divided between its four different campuses, and offers a wide variety of study programs. The strategic plan of the university is under revision, but central ideas in this work are the key drivers in the High North strategy which was launched by the previous government: climate change, relationship with Russia and resources in the high north . As the draft to the university’s future strategy explicitly names the relationship with Russia, it means that common projects and collaboration with Russian institutions of higher education are welcome. This is important to mention as it explains the frames for the collaboration that this paper presents. It also provides an understanding of why such projects receive economic funding which makes collaboration between universities on opposite sides of the Norway/Russia border easier. The collaboration between the faculty at the English Department of the Department of Education at UiT, The Arctic University of Norway, Campus Alta and MIBO, International Institute of Business Education in Murmansk began in the fall of 2010. It was initiated by independent faculty members based on personal interest for collaboration across the border and the want to learn about teacher training college, the role of the English subject in school, and language didactics in general, in the neighbouring country. The first contact between the two institutions was made via e-mail and two members of faculty from Alta travelled to Murmansk for initial talks. It was soon established that the interest for- and the aim of the collaboration were common for faculty on both sides, and the visit ended in an agreement to arrange a joint study module called English Learning in an Intercultural Perspective: Russia and Norway, as well as a draft for the module’s study plan. Understand the educational systems in Russia and in Norway. Understand the principles and practices of second language acquisition in Russia and in Norway, in particular English teaching. Plan and conduct a practice teaching project. Show how cultural differences and differences in teaching and language learning are connected. Be able to communicate and cooperate with students from the other side of the border. The main objectives of the study module are that students from the two countries should cooperate and communicate, that they should become aware of how culture is linked to language teaching and learning, and get an insight into whether English teaching is conducted differently in Russia and Norway. It was important to establish a good online “meeting-spot” for the participating students. Initially, the most important reason was that they were divided into groups consisting of Russian and Norwegian students who should collaborate throughout the module’s work-period, as well as present a common oral group-exam at the end. Faculty at the two universities agreed on the importance of forming mixed groups so that ideas and experiences from the different perspectives and cultures were “forced” (in a positive way) to the surface during observations and assignments. The cooperation and communication between students were planned to be organised via e-mail, Facebook and other online platforms if available to- and wanted by the individual students (examples are Skype, FaceTime, etc.). The means of communication via digital resources are vast, and secure easy access to a variety of ways to stay in contact. Besides, it is normally easy to motivate students to communicate online as they are frequent users of such internet sites anyway. Thus, they master using the tools very quickly and thoroughly enjoy it. The first week of the course is conducted at the International Institute of Business Education (MIBO) in Murmansk, where Norwegian and Russian students are matched to form study groups. There will be lectures about the Russian education system as well as about English teaching methods. During the last days students observe English classes in a Russian school. Later Russian students come to Alta for an equivalent experience. The mixed student groups have common oral exams showing differences and/or similarities in terms of how English is taught in both countries. The course offers close cooperation between Russian and Norwegian students, which forms an element of intercultural learning. Active participation and appropriate demeanour are compulsory, and students who show disrespect to academic and cultural norms can be excluded from participation in any arrangements and will not receive a grade . The module description clarifies that the collaboration includes a physical mobility as well. The two universities have run the module once per year since the fall semester of 2011, and since then it has shown that the physical mobility is the most important element of the module. First and foremost because that is what motivates the students to participate in the module, secondly because the students seem to communicate better face-to-face and do not use the means for telecollaboration as much, neither before the physical mobility nor after. The physical mobility consists of a one week visit to each of the universities/cities. To elaborate on the module-description above; the weeks contain lectures at the universities, observations of English language classrooms at all levels (year 1 through 13), as well as group work and assignments about the similarities and differences that the students experience, learn about and observe during the visits to their neighbouring country. The second, and last, week they meet ends with an oral exam. If passed, the students are awarded 5 ECTS at UiT, The Arctic University of Norway; this also includes the students from Murmansk, Russia. This is important to point out as it partly explains the university administration's support for the module, owing to how universities are financed. It is possible to arrange the physical mobility because it is partly financed by a program called Barentsplus , a scholarship program for higher education institutions in the Barents region. The program supports student and teacher exchanges, as well as joint course development (barentsplus.no) and the module English Learning in an Intercultural Perspective: Russia and Norway has been granted scholarships every year. This is vital in order to organise the physical mobility that has proven to be the most successful aspect of the study module. However, it is negative for the telecollaboration part of the module, as students seem to “postpone” communication until they meet face-to-face. The collaboration between the two universities in northern Norway and north-west Russia will continue, due to the relevance in content of the study module, mutual interest among faculty of the two institutions, and because it receives funding which makes the physical mobility possible. Teaching is organized as lectures (in class and on the Internet), seminars, group work, and as work in international teams using electronic platforms. In between the class meetings students have to work individually or in groups on their tasks (written assignments, films, reports, and websites). The university uses the electronic platform Class Fronter. Some modules may use additional electronic platforms for teamwork and assignments, and students need to become acquainted with the technology . This again is based on the general ideas of the universities where webinars, streaming of lectures, and other internet/computer based modes of education are stressed. Secondly, the faculty who arrange the module and are responsible for its content must focus on tasks and assignments that make it necessary for the participating students to communicate and cooperate via different telecollaboration tools. This is easily done by for example making the tasks compulsory and part of the final grade. Still, the two universities are very fortunate. The opportunity for physical mobility that the scholarship grants is valuable. Unanimous reactions from students are that they learn more from visiting the neighbour country and by “living” it for one week, than they would from any other type of instruction lasting a whole semester. The learning environment, both for language practice and cultural awareness, is most effective and lasting when they visit each other’s cities. The success for the joint study module English Learning in an Intercultural Perspective: Russia and Norway arranged by UiT, The Arctic University of Norway, Campus Alta and MIBO, International Institute of Business Education in Murmansk, is due to personal initiative and engagement by faculty at the two institutions. However, it is extremely important that such initiatives for direct collaboration are anchored in the universities’ administration, among the directors, and match the ideas of the institutions’ strategic documents. With the support of the university administration, the faculty will have a much better chance of succeeding when initiating any collaboration across borders. Any funding, in this case the scholarship program aimed at projects in the Barents region, is key. The study module’s relevance is also of great importance when deciding on cross-border collaboration. In this case a study of the similarities and differences in teacher training college, the role of the English language, and methods and language didactics in the English language classrooms in Murmansk and Alta, are of significance in this region. Teachers in northern Norway will most likely meet some pupils with Russian background; who have immigrated with their parents and received part of their education in Russia, and/or are born in Norway from Russian immigrants and receive help with homework etc. from parents who are accustomed to Russian standards. When teaching these pupils it is very useful to have the insight that this study module provides; both when it comes to knowledge about the educational system, the role of the English language, as well as the cultural dimension that this collaboration provides. Barentsplus. http://barentsplus.no/. Last accessed: March 11, 2015. Study plan – English Year Course. 60 ECTS points. Module based, Campus Alta. 2015/16. Available from http://uit.no/Content/401037/Study%20plan.English%20year%20course%202015-2016.pdf. Last accessed: March 11, 2015. UiT2020: Towards a new strategic plan for UiT. http://en.uit.no/om/art?p_document_id=356184&dim=179033. Last accessed: March 11, 2015. UiT2020: Towards a new strategic plan for UiT. http://en.uit.no/om/art?p_document_id=356184&dim=179033. Last accessed: March 11, 2015. Highlighted in italics by the author. For full overview of the module go to: http://uit.no/Content/401037/Study%20plan.English%20year%20course%202015-2016.pdf, p. 20. For more information about the program, its objectives, application requirements, etc., see http://barentsplus.no. This paper describes a TeleTandem language exchange project between English speaking Spanish students at Georgia College, USA, and Spanish speaking English students at Universidad de Concepción, Chile. The aim of the project was to promote linguistic skills and intercultural competence through a TeleTandem exchange. Students used Skype and Google Hangouts for monthly synchronous conversations where they interviewed each other, and exchanged information about their lives and cultures. The project also involved a monthly blog and a video report where students talked about their TeleTandem partner and reflected on their learning experience. Keywords: Telecollaboration, tandem, teletandem, institutional tandem, language exchange project, synchronous communication, oral communication, interlanguage learning, intercultural competence. The project involved American students majoring or minoring in Spanish taking an Intermediate-Mid level /B1 level . It also involved Chilean students taking a B1 level Communicative English course and majoring in the sciences or engineering fields. Students’ age ranged from 18 to 24 years old. The American group was predominantly females and the Chilean group was predominantly males. The Web 2.0 tools chosen for this project were Skype, Google Hangouts and public blogs. Students who were grouped in pairs used Skype. Several students were partnered in trios because the Chilean group outnumbered the American group. These students used Google Hangouts because it allows group interaction of more than two users. Most of the students had used Skype before and just few where unfamiliar with Google Hangouts. The aim of the project was to promote the development of students’ linguistic skills and intercultural competence through the Teletandem exchange. Students focused on improving their communication skills through the exchange of information about their lives, cultures and areas of study. The project followed the three main Tandem principles: languages must not be mixed, reciprocity and autonomy (Vasallo & Telles, 2006). This project was carried out within an institutional context (institutional tandem) (Vasallo & Telles, 2006). Therefore, it was necessary to have a pedagogical control that modified in certain degree the principle of autonomy. Consequently, instructors selected the topics, integrated the project into the course syllabi and designed individual assessment tools that reflected each course’s learning goals. In each session students negotiated meaning, exchanged information, spoke in the target language, and helped their partner(s) practice the target language acting as mentor or instructors (Little & Brammerts, 1996; Vasallo & Telles, 2006). Sessions were scheduled once a month, throughout a semester and lasted from 40-60 minutes. Sessions were held in a language lab setting with a language lab Coordinator assisting during the sessions. Instructors recommended interaction outside the classroom in order to increase oral communication practice and to promote the principle of autonomy (independent Tandem), which was not possible to achieve in the classroom. Each course had a different set of topics reflecting the course material. Topics in the English course focused on preparing a study abroad trip to the USA. Topics for the Spanish course reflected the grammar and cultural themes of the textbook. During the last session students were allowed to talk about their personal interests. Figure 1. Shows the organization of the topics. Likes and dislikes, entertainment, music, holidays, and festivities in Chile. Past events, Past trips, Childhood, Family in Chile. Future Plans, College life and job opportunities in Chile. How to apply to a US college. Future plans: job, under graduate and graduate studies. Trips, tickets, airlines, security rules at airports. Opening a bank account, types of accounts, credit or debit cards, buying clothes, and textbooks. Figure 1. Organization of topics for each course. To keep structure, the project consisted of a series of four steps. The first was to collect contact information from both groups. The instructor in the English course grouped students in pairs or trios according to career interests. The second step was a training session where the instructor explained the project guidelines, assigned partners, demonstrated how to use the blogs, explained the grading criteria, meeting times, dates and topics for each session and brainstormed ideas related to the topics. All the students using Google Hangouts practice on their own before the first session. In the third step, classes met at in their respective language labs, and students established initial contact in a synchronous communication that lasted 40 minutes. Students received additional clarification concerning the discussions and vocabulary used during the sessions to follow. The language lab Coordinator was in charge of giving technical support as needed. At the end of the session, the instructor asked students to share their experiences and to provide feedback. Instructors shared this feedback, commented on the session and made necessary changes to the project. In step four, students in both classes reported their Teletandem learning experience using the task designed by their instructors. The main task was to communicate orally in a synchronous Teletandem exchange learning. Students had to interview each other using an informal conversation approach and following the topics designed for each session. If students completed the tasks before the end of the session, they were encouraged to discuss any other topic of choice. The Spanish course learning goals concentrated on reviewing basic grammar concepts and improving students’ writing skills. Students in this course had to open a blog account and write in Spanish summaries and reflections of the learning experiences and interactions with their Teletandem partner(s). American students shared the blog with their Chilean partner(s) with the goal of establishing an additional written communication with their partner. The English instructor strongly suggested to her students to comment on Spanish students’ blogs. Students in the English course had to present at the end of the semester a video where they had to talk about their American partner, reflect on their learning experience and give feedback on the project. Assessment is an integral part of online collaboration and should reflect the learning goals of the course. The Spanish students were evaluated on their writing skills through their blog entries. They were assessed on content, organization, grammar and vocabulary following the criteria designed by Lee and Van Patten (2003) for assessing writing assignments in language learning. Each entry was required to have a minimum of 300 words. The instructor focused on the correctness of the linguistic discourse and evaluated the intercultural competence. Students compared and contrast both cultures. The author does not have much information about how the English students' videos were evaluated or the grading criteria the instructor used to assess them. Even though positive feedback was received from both groups, the author only analysed the feedback made by students in the Spanish course. The American college is geographically located in a rural area in the Southeast of the United States. For this reason, it is difficult for language instructors to expose students to real interactions with native speakers of the target language. Thus, students valued the opportunity to experience a synchronous Teletandem communication with a native speaker. They found the experience very innovative, stimulating and appealing for learning a language. The Teletandem exchange became an alternative and innovative classroom activity by which students expressed a high level of motivation. The nature of the project was a determinant factor for such motivation. Students also expressed that different aspects were influential in their learning process, among them: the linguistic knowledge acquired and the intercultural competence gained. Students expressed that Teletandem exchange is more effective in the language learning process when it is incorporated into a course syllabus than when used independently. Most students found structured suggested topics to be useful. In addition, a majority of the students felt more comfortable encountering unfamiliar words, developed confidence in their linguistics abilities and worry less about making mistakes. Students thought that the Teletandem exchange project was key in improving their speaking, listening and writing skills in their new language, especially when compared to other course related material and activities. With regard to intercultural competence, students reported that the Teletandem experience helped them gain more in-depth cultural understanding and diminished some preconceived stereotypes; however, they did not elaborate on any specific stereotype. Students also stated how exciting it was to learn how similar the life of a college student is in the US and in a Spanish speaking country. This aspect of the project promoted rapport among partners and might be an element that improved the learning outcome. Some of the most common and difficult to predict issues with any Teletandem project are technical difficulties. Through the project both groups had problems with Sykpe, headphones, webcams and computers in general. Students in both groups received technical assistance from language lab Coordinators and their instructors. During the initial session, the instructors and the lab Coordinators worked hard to solve several technical issues and students had to begin communication through Facebook. This social media was helpful on helping to break the ice and lower students’ affective filter but students felt frustrated because they could not orally communicate with their partners. Other problems were: time zone difference, time difference between scheduled classes, odd number of students in each group, students’ accountability, and different learning goals and outcomes for each group. Also, English students did not participate in writing comments in their Spanish partners’ blogs. Out of 14 blogs, only one student received one comment in her blog from her partner. This lack of participation from the English students could de-motivate Spanish students when writing their blog entries. Students also expressed their desire to have more time preparing their topics in class. They wanted to receive input and feedback from their instructor. For the instructor point of view, this is an important lesson learned. For future Teletandem exchanges, it is necessary to create more meaningful activities related to the topics and to develop them in-class the day before each session (Martins Moiteiro, 2009). Teletandem exchange projects are a good practice for interlanguage learning and intercultural competence. Through a Teletandem project students can have a one-on-one oral communicative exchange with a native speaker who will help them improve their linguistic skills and learn about the target culture. In this Teletandem exchange project, students valued the opportunity to communicate with students of the target language. They made the most of the experience by improving their linguistic skills and overcoming their fears when communicating with a native speaker. During the project, students also became mentors and learned from each other. Students as well as instructors learned valuable lessons from the experiences. There were some difficulties that were possible to adjust while others were more difficult to control. These challenges showed the instructors how to improve the design and integration of the Teletandem exchange project in the language curriculum. The success of any online exchange partnership is based on its proper integration into the language curriculum (O’Dowd, 2007), and the lessons learned in this project set up the foundation for the appropriate incorporation of many more successful Teletandem projects in our language classrooms. American Council on the Teaching of Foreign Languages (2012). Proficiency Guidelines. Retrieved from http://www.actfl.org/sites/default/files/pdfs/public/ACTFLProficiencyGuidelines2012_FINAL.pdf. Council of Europe (2001). Common European Framework of Reference for Languages. (2001). Retrieved from http://www.coe.int/t/dg4/linguistic/Source/Framework_EN.pdf. Lee, J. F., & VanPatten, B. (2003). Making Communicative Language Teaching Happen. NewYork: McGraw-Hill. Little, D., & Brammerts, H. (1996). A guide to language learning in Tandem via the Internet. CLCS Occasional Paper No. 46, Trinity College, Centre for Language and Communication Studies, Dublin, IR, p. 87. Martins Moiteiro, N. (2009). Action research on Teletandem: An analysis of virtual intercultural communication between students from Brazil and Germany (Master’s thesis, Johannes Gutenberg University) Retrieved from http://www.teletandembrasil.org/site/docs/MOITEIRO.pdf. Vasallo, M. L., & Telles, J. A. (2006). Foreign language learning In-Tandem. Theoretical Principles and Research Perspectives. The ESPecialist, 25(1), 1-37. Retrieved from http://www.teletandembrasil.org/site/docs/Tandem_Part_I_The_Specialist_Revised_10_identified.pdf. O’Dowd, R. (2007). Evaluating the outcomes of online intercultural exchange. ELT Journal , 61(2), 144-152. European Union Council Resolution (2001). Vocabulary is an area that requires foreign language learners to work independently and continuously both in and out of class. In the Japanese EFL setting, for example, more than 97% of the population experiences approximately six years of English education at secondary school during which time they are required to learn approximately 3,000 words (i.e., lemmas). Given the lexical distance between Japanese and English, this leaves Japanese university EFL learners with a long way to go before they can acquire a sufficient number of words to comprehend authentic texts in English. To help Japanese university EFL learners sustain their vocabulary learning, the researchers have developed Lexinote, an e-portfolio system that allows learners to record and save the target words they encounter online, to search for them in online dictionaries, to practice them in several ways including written and oral rehearsals according to word familiarity (i.e., level of understanding of each lexical item), and to share their own output with peers. Learners are guided to monitor and control their vocabulary learning metacognitively according to word familiarity. Lexinote also provides learners with multimedia materials such as audio lessons for business and academic vocabulary development and online video lectures to prepare for classes conducted in English. Instructors can monitor students' learning records by number of words recorded, by type of practices chosen, and by how frequently they edit their learning records. This paper introduces the key concepts and basic functions of Lexinote and discusses how it can benefit learners, instructors, CALL researchers and developers with results from a survey on learners' perceptions. Keywords: Vocabulary learning; e-portofolio; vocabulary learning strategies. Vocabulary is central to language and is of critical importance to the typical language learner (Zimmerman, 1997); however, for many learners, especially in a foreign language setting, vocabulary learning is a long and arduous process. For unassisted comprehension, learners need to recognize enough vocabulary to cover 98% of text: 8,000-9,000 word-families for written text and 6,000-7,000 word-families for spoken text (Nation, 2006). This usually means that foreign language learners are required to work independently and continuously out of class to acquire sufficient vocabulary. In Japan, learners are required to learn approximately 3,000 words (i.e., lemmas) during their secondary education (MEXT, 2009). Therefore, learners who continue to study English at a tertiary level still need to learn an enormous number of words, even after six years of English study. Besides the challenge of the quantity of words, or width of vocabulary, learners need to know various aspects of words, or depth of vocabulary, in order to be able to use the language effectively. English class hours for Japanese university students are not usually adequate to cover this learning burden, leaving learners in need of assistance with their sustainable vocabulary learning. The teaching and learning of vocabulary learning strategies (VLS) can play a significant role in solving such problems in foreign language vocabulary learning. VLS research has reported on the effects of particular strategies or combinations of strategies (Brown & Perry, 1991; Ellis & Beaton, 1993), on the effect of metacognitive strategy instruction (Mizumoto & Takeuchi, 2009; Rasekh & Ranjbary, 2003), and on proposals for VLS instruction (Fowle, 2002; Schmitt & Schmitt, 1995). On the other hand, it has been found that learner use of VLS changes over time depending on their development in the target language (Schmitt, 1997); thus, an effective strategy for one particular learner is not always effective for others. The difficulty in identifying an effective combination of strategies has also been questioned (Sawyer & Ranta, 2001). However, one promising line of research is in the use of metacognitive strategies, the monitoring and controlling of other cognitive strategies (Gu & Johnson, 1996; Mizumoto & Takeuchi, 2009; Rasekh & Ranjbary, 2003). It can be inferred that learners should be trained to monitor and control various VLS metacognitively according to their general level of proficiency and their level of understanding of each word. To tackle the issue of sustainable vocabulary learning, the researchers developed Lexinote, a web-based e-portfolio that enhances the metacognitive use of VLS and promotes independent and continuous learning. This paper will describe its basic functions and, based on the results of a survey of learners' perceptions about using the system, will discuss how it can benefit learners, instructors, CALL researchers and developers. This section describes Lexinote, its relationship to vocabulary learning strategies, its dictionary data, and how it can be used for self-study and class assignments. Lexinote is a web-based e-portfolio that helps language learners visualize their vocabulary knowledge so that they can monitor and control their own learning processes and products. Lexinote can be used not only by learners as a self-study tool but also by instructors as a way to feed assignments in class. After coming across a new word, learners typically use Lexinote to search for a word in an online dictionary and record its information: meanings in L1, definition in the target language, example sentence, related words (e.g., synonyms, antonyms, collocations), and their own sentence containing the target word. Later, as their understanding of each lexical item grows, learners edit this information and continue to rehearse the word until it becomes knowledge at their disposal. We will further describe how learners can use Lexinote for self-study and class assignments later in this section. Lexinote uses the notion of word familiarity as an indicator of learners' understanding of each lexical item. Although vocabulary knowledge is sometimes conveniently dichotomized into two categories �receptive and productive� for educational or research purposes, the boundary between the two categories is vague, and Melka (1997) suggests that the distinction be avoided or even abandoned. Using the term familiarity, she also insists on the need to recognize different levels or a continuum of vocabulary knowledge. Similar attempts to capture learners' vocabulary knowledge have been done by other researchers. Hatch and Brown (1995) proposed five levels of word familiarity from 1 �encountering new words� to 5 �using the words�. Paribakht and Wesche (1996) developed the Vocabulary Knowledge Scale (VKS) to assess language learners' vocabulary knowledge from 1 �I don't remember having seen this word before� to 5 �I can use this word in a sentence.� These proposals imply the importance of seeing learners' vocabulary knowledge as a gradually and continuously developing continuum rather than a dichotomous shifting from receptive to productive state. Following these examples, Lexinote employs five levels of word familiarity: 1. I have seen this word, 2. I know its form and sound, 3. I can recall the word from its L1 equivalent, 4. I can recall the word when I see it in an example sentence, 5. I can make my own sentence with the word. Learners are required to choose the appropriate level of word familiarity each time they register a target word and edit its information in the system so that they become aware of their state of knowledge. Hence, learners are expected to metacognitively monitor and control their own vocabulary learning through the concept of word familiarity. Learners can adjust the word familiarity manually themselves or have the system automatically adjust it according to the type of rehearsal completed. During the actual learning process, it could be the case that a learner at first develops their knowledge of a word linearly, but cannot maintain the same knowledge state or even returns to an earlier state. It could also happen that a learner can recall a word used in a sentence (Familiarity 4), but cannot recall its L1 equivalent (Familiarity 3). Lexinote thus uses the notion of word familiarity to idealize the process of vocabulary knowledge development, enabling learners to better monitor and control their own vocabulary learning. The monitoring of vocabulary knowledge based on word familiarity is one form of metacognitive vocabulary learning strategy use; however, Lexinote also targets other cognitive VLS that can be metacognitively controlled by learners. Schmitt (1997) proposed two types of VLS: discovery strategies and consolidation strategies. A discovery strategy is one that learners use when they try to identify the meaning of a word, such as guessing the meaning from context or looking a word up in the dictionary. Lexinote targets seven types of consolidation strategies: oral rehearsal, written rehearsal, note-taking, reference, organization, language exposure, and metacognitive control. Table 1 shows the relationship between each VLS and the related Lexinote learning activities. Recording related words (e.g., collocations, synonyms, antonyms) in the item window. Table 1. Vocabulary learning strategies and related learning activities on Lexinote. It is suggested that there are 114,000 word-families in English and that well-educated native adult speakers of English know around 20,000 word-families on average (Goulden, Nation & Read, 1990). However as we have seen in the previous section, the goal of foreign language learners would be 8,000 to 9,000 word-families in order to be able to read authentic text. In developing the dictionary data for Lexinote, the researchers used the Corpus of Contemporary American English (COCA) 20,000 word frequency list (Davies, 2008) as a base list. COCA is the largest freely-available corpus of English, and the only large and balanced corpus of American English (Davies, 2008). Then the base list was compared with other available wordlists for Japanese English learners: Hokkaido University Vocabulary List (HUVL) (Sonoda, 1996), JACET 8,000 (Committee of Revising the JACET Basic Words, 2003) and SVL 12,000 (ALC, 2009). All the wordlists were merged to generate a total of 18,515 headwords as the final wordlist for Lexinote. Then the headwords were put into levels from 1 to 6 according to the HUVL (Sonoda, 1996): 1 junior high school mandatory level (786 words), 2 senior high school mandatory level (1,778 words), 3 university entrance examination level (2,096 words), 4 university basic level (1,520 words), 5 university advanced level (1,274 words), and 6 (not in HUVL). These HUVL levels were used so that Japanese EFL learners would be able to recognize the educational level at which they would be expected to learn each word. In addition, based on Coxhead (2000) and Chujo (2003), the researchers chose 942 academic and/or basic business words from this list for learners at their institution to learn, producing the Hokkai-Gakuen Humanities Word List 942 (HWL942). In order to assist learners' self-study in vocabulary, Lexinote employs a �self-study note� (Figure 1). In the self-study note, learners copy whatever text they want to learn from the Internet and paste it into the note section to check. 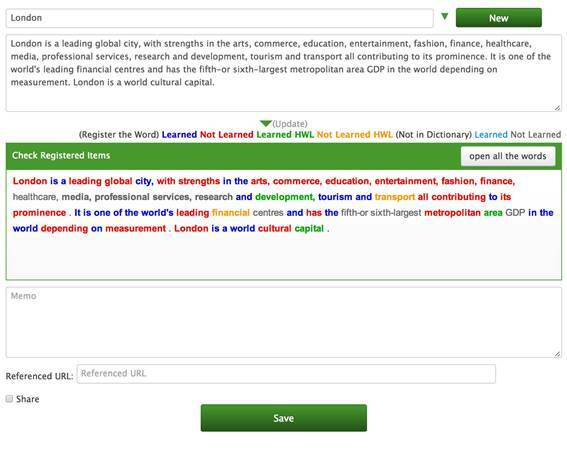 If a word is already registered or has been used by the learner, it is shown in green for HWL words and in blue for other words. If a word has not been learned, it is shown in yellow for HWL words and in red for other words. If a word is not in the Lexinote dictionary, it is shown in pale blue when it is a learned word and in grey when not learned. When a learner finds a word he/she wants to learn, he/she clicks it and the word will appear on the left side of the notebook (Figure 2). If a word is registered in the Lexinote dictionary, L1 (Japanese) equivalents will automatically appear. If the learner wants more information about the target word, he/she can use one of the four online dictionary link buttons above the notebook space to open a new window in the Internet browser; the dictionaries are a comprehensive English-Japanese dictionary (Weblio), a thesaurus (Thesaurus.com), a monolingual English learner dictionary (Longman Dictionary of Contemporary English) and an English-Japanese and Japanese-English dictionary (Eijiro). After confirming or inputting in the �meaning� section, the learner can choose whether he/she wants to register the word or to continue recording other fields such as �Example sentence,� �Definition,� �Related words� and so on. When the learner registers the word, he/she will first choose his/her familiarity level of the target word from 1 (I have seen this word) to 5 (I can make a sentence with this word). The learner also has to decide whether he/she wants to practice the word or not by choosing �yes� or �no� at the �Practice later?� section. In this way, Lexinote encourages the learner to take control of and feel ownership for his/her own learning processes. Typical learning stages and activities are described in Table 2. Figure 1. Self-study note on Lexinote. Figure 2. Notebook section on Lexinote. Table 2. Typical learning stages and activities on Lexinote. To further enhance sustainable vocabulary learning, Lexinote allows instructors to feed assignments to their learners. There are two assignment types, website and video, and each of them specifies certain words as targets to be learned. In the website assignment type, a teacher designates a given website, usually one that contains the targeted words in text so that learners can meet and learn words in context. In the present researchers' case, the purpose is to have learners master a specific word list (HWL942), so they specify a blog page consisting of the target words, definitions, example sentences and an audio file introducing the target words and information (e.g., http://hguweb.jp/humanities-942/l40/). 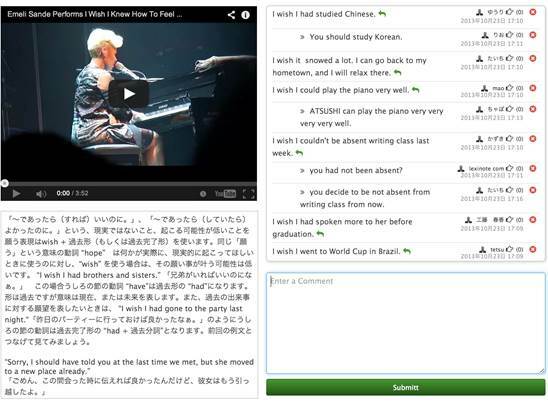 The second assignment type, video assignments, allows teachers to feed a YouTube video containing target words and to provide a simple computer-mediated communication function to enhance learners' communication regarding the assignment. 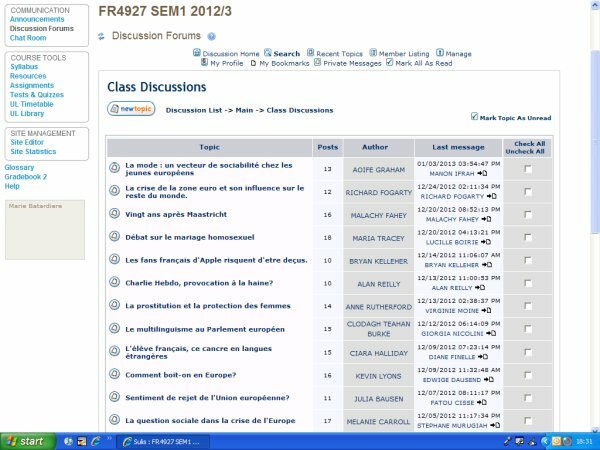 Learners can post their comments and also reply to other learners' comments on the assignment page (Figure 3). The words that learners use in their posts and replies are all recorded and stored in the e-portfolio. Figure 3. Assignment screen and learners' comments on Lexinote. In order to facilitate learners' metacognitive control, Lexinote requires learners to decide whether they want to practice the target word later when registering it in the e-portfolio. Learners' judgment to practice or not is itself a manifestation of the strategy of metacognitive control; likewise, each rehearsal function is designed to incorporate one of the VLS listed in Table 1 depending on the word familiarity level. Details of each rehearsal function are described in Table 3. Table 3. Rehearsal functions and vocabulary learning strategies according to word familiarity. To what extent do Japanese EFL learners perceive the vocabulary e-portfolio functions to be effective for vocabulary learning? In evaluating their learning with the vocabulary e-portfolio, what aspects are salient for Japanese EFL learners? The participants are 63 (F18/M45) EFL learners enrolled in a general English course targeting a test for international communication (TOEIC ®) from two intact classes. All of them are first-year students, meaning they have had at least six years of English study in Japanese schools, at a private Japanese university. None of them have had the experience of staying more than a month in any English speaking country. Six of the items elicit the participants' perception of the usefulness of Lexinote and of its different features: the e-portfolio itself, the compilation of learning records in the notebook, the online dictionary, the rehearsal function, word familiarity rating, and class assignments. The seventh item is about the participants' satisfaction regarding learning with Lexinote, and the final item inquires the reasons in free description form. The participants were asked to respond to the first seven items by indicating their level of agreement using a six-point Likert scale (0: Completely disagree to 5: Completely agree). A six-point Likert scale was used in order to avoid ambiguous judgements due to choosing the point in the middle. Seven weeks after Lexinote was introduced in the course, the participants' responses were collected anonymously via an online learning management system (Moodle 1.9.6). Table 4 shows the descriptive statistics of the seven items regarding the participants' perception and evaluation of Lexinote. The reliability of the questionnaire was satisfactory as assessed by Cronbach's alpha coefficient ( = 0.91). 1. Lexinote is useful for my vocabulary learning. 2. The notebook on Lexinote and its learning records are useful for my vocabulary learning. 3. The online dictionaries on Lexinote are useful for my vocabulary learning. 4. The rehearsal functions on Lexinote are useful for my vocabulary learning. 5. Managing learning by word familiarity is useful for my vocabulary learning. 6. The class assignments on Lexinote are useful for my vocabulary learning. 7. I am satisfied with vocabulary learning using Lexinote. Table 4. Descriptive statistics of the participants' perception of Lexinote. *All comments are translated from Japanese into English by the authors. As for research question 1, the overall results of the questionnaire revealed the learners' positive evaluation of Lexinote, with 52 participants, more than 80% of the total participants, responding that they are satisfied with vocabulary learning with Lexinote seven weeks after starting to use it (Item 7). Though this result cannot be compared to the results of other groups of learners as in a rigorously designed experimental study, it would be fair to say that learning with Lexinote is generally supported by most participants. The result of Item 1 also reveals that the participants perceived Lexinote as useful for vocabulary learning. The slight differences in the mean scores of other items help explain the participants' preferences for vocabulary learning. Items which receive a comparatively higher evaluation are those describing resources and opportunities for learning such as Item 3, 4 and 6, rather than items describing features that aim to enhance learners' independent and self-regulated learning such as Item 2 and 5. This implies that the learners need considerable assistance in vocabulary learning before they are able to establish independent and sustainable learning. However, this should be further investigated as this survey was conducted only seven weeks after the system was introduced. In the future, a longitudinal study should be conducted to examine further changes in learners' perceptions and attitudes, either positive or negative, toward vocabulary learning. As for research question 2, the participants' responses to Item 8 give insight into different perceptions by the participants. A glance at comments by the negative group suggests that more careful instruction is needed for some learners to fully recognize the advantages and disadvantages of using technology for their learning. Though some may prefer learning with paper and pencil, this could be complemented by learning via computer in a wider view as, for example, Lexinote allows its users to download their data of learning and learned vocabulary in a comma separated value (CSV) file format so that they can print it out as their own word list for self-study. These comments, however, imply that some learners think that they have to choose either learning with paper and pencil or learning with computer. Students may need explicit instruction on how to combine the new learning methods, i.e., use of ICT, with familiar methods, i.e., paper and pencil. On the other hand, comments from the positive group reveal that these participants do understand the underlying aims of vocabulary learning with Lexinote. They are aware not only of the obvious advantages of learning with technology such as �practicing the same words repeatedly� and �increasing time for studying�, but also of the metacognitive advantages of e-portfolio to �see what words and how well� they are learning. Cautions have to be made here too, however, as learners' perceptions likely evolve with a longer period of learning. Therefore, future research should probe learners' perceptions and actual learning outcomes in an extended learning period. Because Lexinote helps learners visualize the words they meet, record, practice, and use, it will be of benefit to both learners and instructors in monitoring and controlling sustainable vocabulary learning. It is learners and their instructors who are at the center of learning, not the algorithm of a system that automatically controls overall learning. Constantly seeing what they are learning, and what they have learned, learners can better understand their current status and future goals in their own vocabulary learning. Understanding what and how learners have and have not learned, instructors can better assist them by providing appropriate assignments and advice. Although Lexinote specifically targets Japanese EFL learners and instructors, the system is available for public use from April 2014 (http://app.lexinote.com/). This will enable CALL researchers and developers to better enhance sustainable vocabulary learning in any language in various settings by rewriting and redistributing the system. The authors also hope to conduct and report a longitudinal and empirical study to examine the effect of using the e-portfolio system on EFL learners' vocabulary acquisition and retention in the near future. ALC (2001). Standard vocabulary list (SVL) 12000. Retrieved 01/05/2008 from http:// www.alc.co.jp/goi/PW_top_all.htm. Brown, T., & Perry, F. (1991). A comparison of three learning strategies for ESL vocabulary acquisition. TESOL Quarterly, 25, 655-670. Chujo, K. (2003). Eigo shokyushamuke �TOEIC goi 1, 2� no sentei to sono kouka. [Selecting TOEIC vocabulary for beginning level English learners and its effects.] Journal of the College of Industrial Technology, Nihon University 36, 27-42. Coxhead, A. (2000). A new academic word list. TESOL Quarterly, 34 (2), 213-238. Davies, M. (2008). Corpus of Contemporary American English (COCA). Retrieved and purchased 12/02/2012 from http://corpus.byu.edu/coca. Ellis, N., & Beaton, A. (1993). Psycholinguistic determinants of foreign language vocabulary learning. Language Learning, 43, 559-617. Fowle, C. (2002). Vocabulary notebooks: Implementation and outcomes. ELT Journal, 56 (4), 380-388. Committee of Revising the JACET Basic Words (Ed.). (2003). JACET list of 8000 basic words. Tokyo: Japan Association of College English Teachers. Goulden, R., Nation, P., & Read, J. (1990). How large can a receptive vocabulary be? Applied Linguistics, 11 (4), 341-363. Gu, P. Y., & Johnson, R. K. (1996). Vocabulary learning strategies and language learning outcome. Language Learning, 46 (4), 643-679. Hatch, E., & Brown, C. (1995). Vocabulary, semantics, and language education. Cambridge University Press. Melka, F. (1997). Receptive vs. productive aspects of vocabulary. In N. Schmitt and M. McCarthy (Eds. ), Vocabulary: Description, acquisition and pedagogy (pp. 99-102). Cambridge University Press. Mizumoto, A., & Takeuchi, O. (2009). Examining the effectiveness of explicit instruction of vocabulary learning strategies with Japanese EFL university students. Language Teaching Research, 13(4), 425-449. Nation, I.S.P. (2006). How large a vocabulary is needed for reading and listening? The Canadian Modern Language Review, 63, 59�82. Paribakht, T. S., & Wesche, M. (1996). Enhancing vocabulary acquisition through reading: A hierarchy of text-related exercise types. The Canadian Modern Language Review, 52, 155-178. Rasekh, Z., & Ranjbary, R. (2003). Metacognitive strategy training for vocabulary learning. TESL-EJ, 7 , 1-15. Sawyer, M., & Ranta, L. (2001). Aptitude, individual differences, and instructional design. In P. Robinson, (Ed.) , Cognition and second language instruction (pp. 319-253). Cambridge University Press. Schmitt, N. (1997). Vocabulary learning strategies. In N. Schmitt & M. McCarthy (Eds) , Vocabulary: Description, acquisition, and pedagogy (pp. 199-227). Cambridge University Press. Schmitt, N., & Schmitt, D.R. (1995). Vocabulary notebooks: Theoretical underpinnings and practical suggestions. English Language Teaching Journal, 49 (2), 133-143. Sonoda, K. (1996). Hokkaido University English Vocabulary List. Retrieved 01/21/2005 from http:/icarus.ilcs.hokudai.ac.jp/jugyo/huvl. Zimmerman, C. B. (1997). Historical trends in second language vocabulary instruction. In J. Coady & T. Huckin (Eds. ), Second language vocabulary acquisition: A rationale for pedagogy. Cambridge: Cambridge University Press, pp. 5-19. Figure 1. ABA English online course. This website is developed and maintained by ABA (American and British Academy: http://www.abaenglish.com), an institution that has been devoted to distance language learning for about 40 years and now delivers its interactive materials for learning English through the Web. The online English learning materials at http://campus.abaenglish.com comprise a full stand-alone general English course for adults consisting of a series of 144 modules or didactic units divided into 6 levels of linguistic competence, covering the whole range of the CEFRL (Common European Framework of Reference for Languages): Beginners (A1), Lower Intermediate (A2), Intermediate (B1), Upper Intermediate (B2), Advanced (B2-C1) and Business (C1). Each one of these levels includes 24 units. The support languages of the course, i.e. the languages in which instructions and help are expressed, are 6: English, French, German, Italian, Portuguese and Spanish. The company is based in Barcelona (Spain) but the course is aimed at a worldwide audience. ABA Film: a short video, ranging from 1 to 3 minutes, showing a situation from daily life and including the language structures and expressions that will be covered in the other sections of the unit. The videos may be watched with or without subtitles and also with the help of the course dictionary. Spaek: it contains the vocabulary and expressions of the unit, translated into Spanish and in an interactive way, so that, by clicking on them, students can listen to them, record their voice and compare their oral performance with the original recording (LRC�). Write: in this section students can click on boxes to listen to a part of the video script, write down what they hear and then receive feedback on what they have written. Act: this part gives students the possibility of choosing one character from the video and role-playing his or her part. The purpose of this is to improve the student's oral fluency, although in a quite controlled environment. Video-class: another video passage in which a teacher explains some grammar and vocabulary issues covered in the unit. Exercises: here students complete fill-in-the-gap and/or translation exercises aimed at improving grammar and vocabulary. Feedback is provided, including the provision of the correct answer. Vocabulary: a list of vocabulary terms from the units is provided in alphabetical order, for the students to listen to, record and compare with the original, together with a Spanish translation. Assessment: an online test checks acquisition of the vocabulary and other linguistic features from the unit. The course recommends the student to follow this learning path in this order, although if a learner chose to do so he or she could jump from one part to the other in a different sequence. Some other features of the website are also worth mentioning. 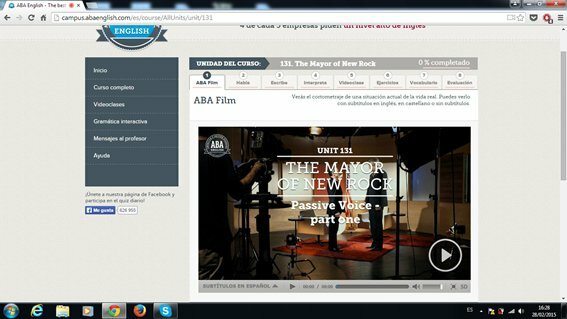 First, regarding the video passages including the video-classes, it is possible to watch the videos in three different ways: without subtitles, with subtitles in English and with subtitles in any one of the 6 source languages, and a course dictionary is available through a hyperlink near the video window. Second, in the sections �Speak� and �Vocabulary�, sentences or individual words are clickable to display a small pop-up menu with three buttons. These allow the learner to listen to the pronunciation, record his or her own voice or compare both pronunciations. This feature, called LRC� (Listen-Record-Compare), is one of the most original of the website and is based on speech recognition technology. Third, in the parts called �Write�, �Exercises� and �Assessment�, the learner can write down open text with the computer keyboard, with or without the help of an oral prompt. Thus, as can be seen, the online resource provides plenty of contact with multimedia learning materials, especially situational videos, and places a particular emphasis on oral practice, both at the listening and pronunciation levels, as a departure point to improve English grammar and vocabulary. Variety within the course comes from a wealth of characters and daily situations, rather than from the structure or the formats of the units, and the student is provided with access to many different English accents and typical expressions. The content of the units, in terms of topics, grammar, vocabulary and linguistic structures is adequate for adults and young learners alike, and matches the CEFRL requirements. The structure of the website in general can also usefully provide gradual learning materials to students who want to advance from one level to the next. When learners are working on one of the 8 main sections of a unit, they also have access to other areas of the learning resource through links that are placed on the left, at the bottom and at the top of the screen. Navigation between the sections is easy and all sections are named in Spanish. The most important ones will be described next. The left-hand-side menu contains 6 sections, giving access, in turn, to the homepage, the whole course where we are, all the video-classes, the interactive grammar (including all the grammar topics covered in the course), a �Contact' feature which allows the user to send messages to a teacher and, finally, a section to get technical support and help. At the bottom of the screen, students can connect to a number of social networks on the Web where the resource is present (Twitter, Facebook, YouTube, Google and a Blog), and, just a little bit below that, there is access to the whole ABA online campus, the user's account and other services of the institution. The level at which the user is working is indicated at the top of the screen together with his or her progression, expressed in terms of the percentage of the course that has already been completed at any given time. This information is also visible for the individual units. All in all, the structure of the website is very clear and comprehensive, and the learning objects, that is the videos and the corresponding tasks, are distributed in a linear form which is easy to navigate. As far as language learning pedagogy is concerned, this online resource follows the Natural Method, a development of the Direct Method. According to this didactic methodology, the oral aspects of the language should come before the written forms, and therefore, learning materials have a strong focus on, first, listening, and then speaking. Pronunciation also plays a central role in the course's activities and in the way linguistic content is presented. Learning takes place through close contact with the linguistic input, making extensive use of visual and oral prompts and aids. From there, the student can derive the rules that are part of the language form. There is, therefore, in this resource a clear emphasis on content, which is noticeable in the type of syllabus that was chosen to organize the units: the so-called Situational Syllabus. The units and the videos as well as the grammar, linguistic structures and vocabulary of each unit are arranged according to situational criteria. More particularly the topics have to do with daily life situations. From this multimedia contact with the target language, via video and digital sound, in a learning environment that could perhaps be regarded as a virtual equivalent of immersion scenarios, learners are encouraged to approach language in an intuitive way, learning through discovery and making their own generalizations about grammar rules. Nevertheless, it does not mean at all that grammar is not taught in a formal manner. Actually, the resource has a significant structural component, and there is an interactive grammar section where grammatical items are directly and formally explained. In terms of the accuracy-fluency continuum, the resource seems to emphasize accuracy, which is approached through repetition drills, although the ultimate purpose of these drills and formal exercises is for the student to achieve a satisfactory degree of fluency, too. Another related methodological approach that is predominant in this learning website is the Audiolingual Approach to language learning, which is deductive in nature and uses, as was mentioned above, a wealth of multimedia learning objects, with a profusion of visual and oral aids. The three most important linguistic components that are covered in the resource are pronunciation, vocabulary, and grammar. The first two are practiced mainly through drills, mimicry and memorization. On the other hand, students are invited to deduce grammar rules on their own after studying the videos and the situations. Yet there is also a very clear and direct instruction of grammar topics, mainly in the video-classes, which are mostly led by a teacher. This combination of an intuitive (indirect) and tutor-led (direct) treatment of grammar content makes the resource very interesting from a didactic point of view. As regards language or communicative skills, there is a focus on the oral component, on the one hand, and on receptive skills, on the other, although all 4 linguistic skills are properly covered. Writing and speaking (mainly through pronunciation tasks) are practiced in a very controlled way, which is typical of computer-assisted language learning processes. Three fundamental features that must be considered when analysing Web- or Computer-assisted language learning resources are interactivity (the way the human user interacts with the computer), interaction (when humans interact through the technology) and feedback (how the resource reacts to students' output and performance). Regarding interactivity, the website is quite rich, since the interactive interface with the computer includes not only the mouse and the keyboard �as in most similar resources�, but also the headphones and the microphone. In contrast, the resource, at least in the didactic units, does not cater for interaction with other students as such, although, very close to the learning units the learners do have access both to a feature to send messages to their teachers, and to several social networks. Thus, there is some degree of human interaction. In terms of feedback, we can differentiate between feedback on oral performance and feedback on written performance. Regarding the former, it relies on the student completely, since it is the student who must compare his or her voice with a model. As regards, the latter, learners have the possibility of choosing between basically two types of feedback: either try to answer correctly in several attempts or access the correct answer directly through an available link. These types of feedback are not very informative or metalinguistic, but are quite appropriate for the language learning approach advocated by the resource. Another aspect which deserves study in online language resources is scaffolding; that is, how the learning material promotes gradual improvement of the students' knowledge and skills, by building on their previous competence. This website does so in a linear way, since practically the only possibility for students to proceed in their learning is by following a pre-established learning path. This is not necessarily negative if the language content is appropriately designed and graded, as is the case here. The resource does not incorporate major active methodologies, such as learning by doing or task-based approaches, but, on the other hand, it is quite learner-centred, since it allows students to control some components of the learning process, basically through a rich interactivity with the material, as we have seen. The resource is not very communicative, either, although two of its features satisfactorily compensate for this limitation. First, it is possible, and easy, to access certain social networks to enhance the learning process, and, second, grammar and vocabulary instruction is highly contextualized, which is a typical characteristic of the communicative approach to language learning and teaching. The usability of this learning website is very high. This comes across very clearly in two aspects in particular. Firstly, the videos �the central part of the learning units� have clear user control features, which makes it easy for students to access content at an individualized pace, and the provision of hyperlinked words and expressions throughout the courses is a consistent way of ensuring easy interactivity. Secondly, navigation throughout the parts of the online resource is very clear, intuitive and, therefore, efficient, due to a series of interactive menus around the central part of the screen. The central part is always occupied by the 8 main sections of each unit and thus could be considered as the main learning �space�. Consequently, the high degree of user-friendliness of this web-based learning resource is a technically-driven feature which has a very positive influence on pedagogy since it allows the materials to be highly learner-centred. The website is very stable and strong from a technical point of view, i.e. the interface of the resource with the user �the learner� is reliable and it works well with no technical mistakes in the recordings or their associated files. Quality of multimedia, the videos, graphics and sound is also very high, which makes the learning experience very enjoyable. Graphic design is pleasing and consistent throughout the courses, too. Additionally, the efficient performance of the LRC� (Listen-Record-Compare) speech recognition technology makes the resource very strong technically speaking. And last, but not least, the feedback is provided very efficiently from a technical perspective. Thus, the website and the language learning materials and features it contains have a very good technical and instructional design, which is a matter of prime importance in Web-based language learning resources for self-study. The courses and units within ABA English are excellent materials for self-study at different levels. The resource's technical, graphic and instructional design is strong and serves the main objective of this website perfectly: to help the contextualized practice and efficient acquisition of oral skills and grammar and vocabulary knowledge of the English language by Spanish-speaking adult learners. The use of videos to illustrate real-life situations in order to improve oral competence and learn the structure of the English language is a remarkable feature of this website. Another strong point of the resource is that it is a stand-alone and coherently organized collection of courses and units that can lead the learner from low to very high levels of linguistic competence in a gradual way. It might be said that the website's approach to language learning is not very communicative. Nevertheless, the courses hosted in ABA English website take full advantage of what the computer (in this case, the Web) does most efficiently at present: namely, provide the language learner with considerable opportunities to practice the most mechanical aspects of the language in a dynamic and interactive way. This kind of practice can be crucial to improve language competence. Esta obra est� bajo una Licencia Creative Commons Atribuci�n-NoComercial-SinDerivadas 3.0 Unported.